The Yorkshire Dales had vanished overnight. In its place had been left a ghostly world of damp swirling mist and heavy dew laden grass. It was not the most pleasant of experiences pulling on damp clothes and sodden footwear. My dry tent clothes were carefully wrapped and packed away, I was already looking forward to getting changed later than evening. 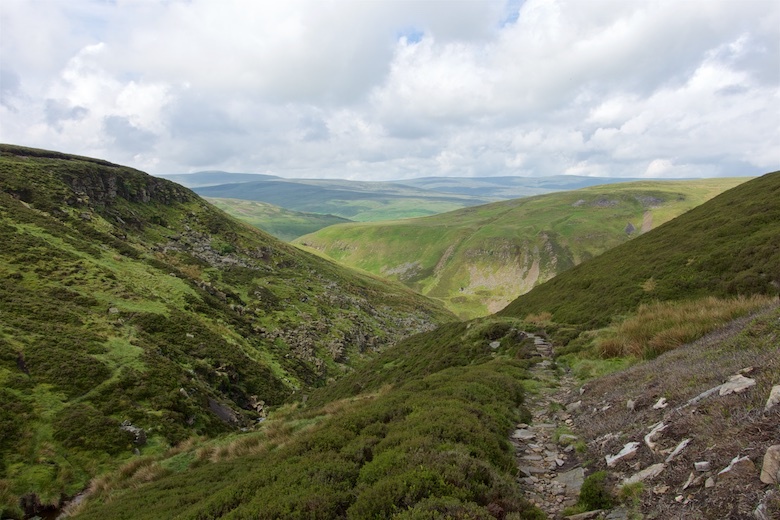 The track named Gilbert Lane runs north for several miles across open moorland, almost due north to Wensleydale. It was deathly silent as we made our way through the mist, bar the odd cry of a Curlew. The miles were quick to the large village of Bainbridge where we made a beeline to the nearest cafe. Unfortunately cafes in tourist places turn out to be tea rooms, which mean smaller portions for high prices. We bagged a table and had lunch number one whilst my feet steamed with socks failing to dry. Rain was threatening again as we set off back into the hills. 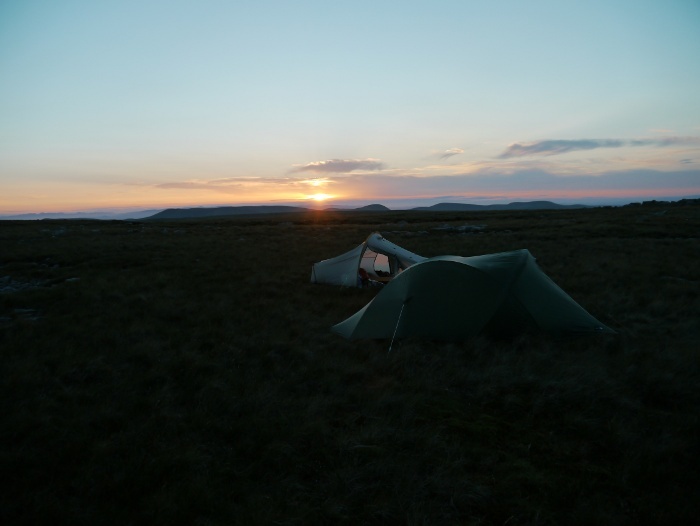 To get to the evenings planned camp we had to cross the moors that separate Wensleydale from Swaledale. A walled track led us steadily upwards before it deposited us in the middle of a field full of cattle. 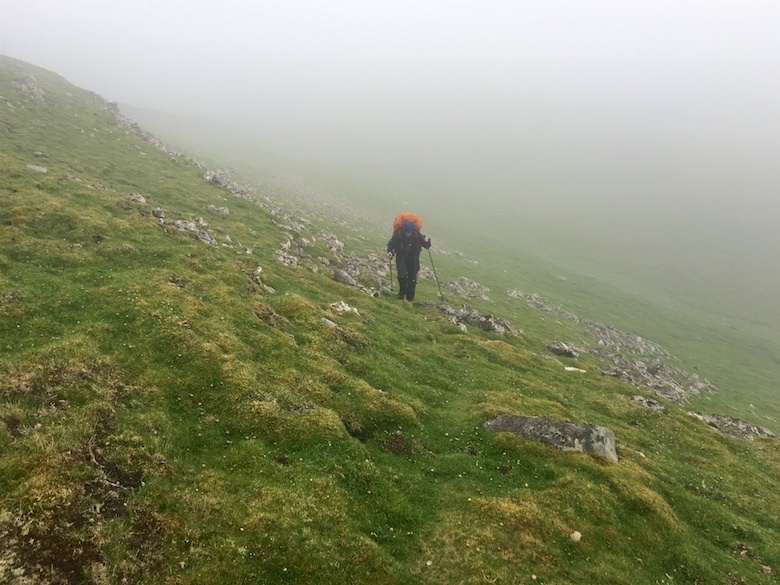 The bridleway then became the figment of a cartographers imagination so we left the invisible line and climbed steep slopes up into the cloud. It became wet once more so in full waterproofs we trudged through the mist towards the top of Oxnop common, where we found a ruined mine building to shelter in for a while. 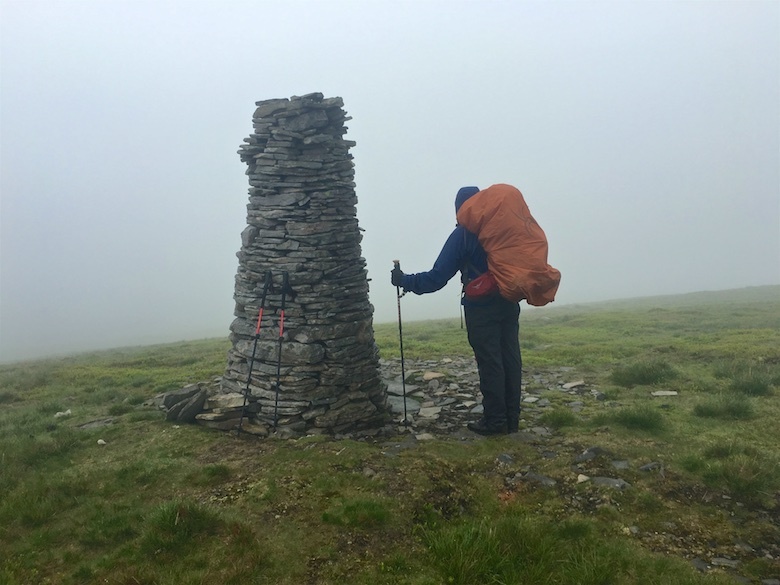 It was pretty damp and miserable on the summit. It was with some relief that we descended below the clouds at exactly the spot where I had planned. That was more down to technology than skill to be honest. Waterproofs came off and were quickly put on again, it was a real chore wearing them whilst so warm and humid. 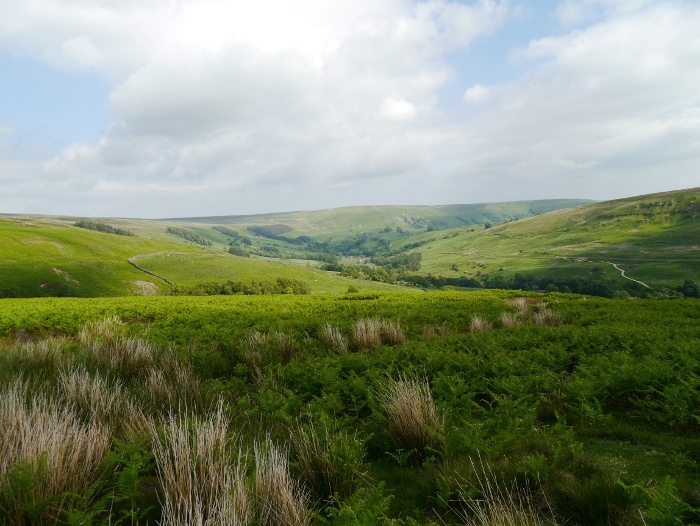 We squelched through the hamlet of Ivelet and found a well hidden pitch on the moors above. To be honest we could have pitched anywhere and remained invisible in the mist and low cloud. 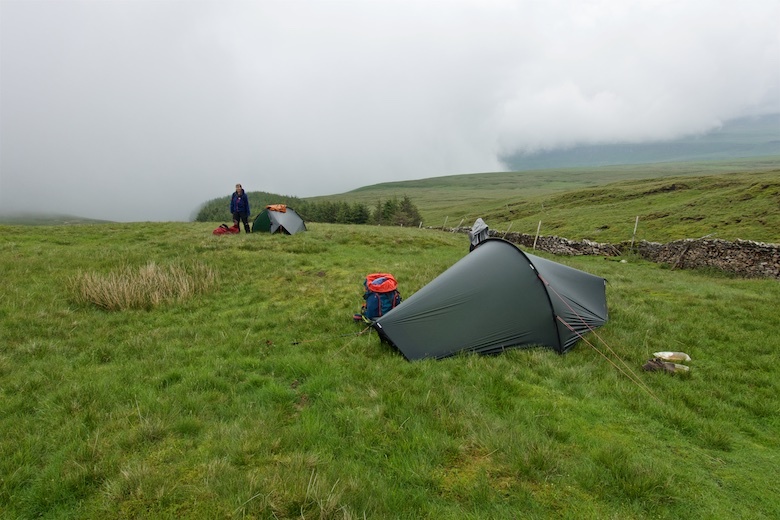 It was another unpleasantly warm and humid night, the tent quickly getting wet with condensation. I was very thankful for those dry clothes. With no wind the only noise on the moors the next morning were the birds, including the strange drumming sound of a snipe. 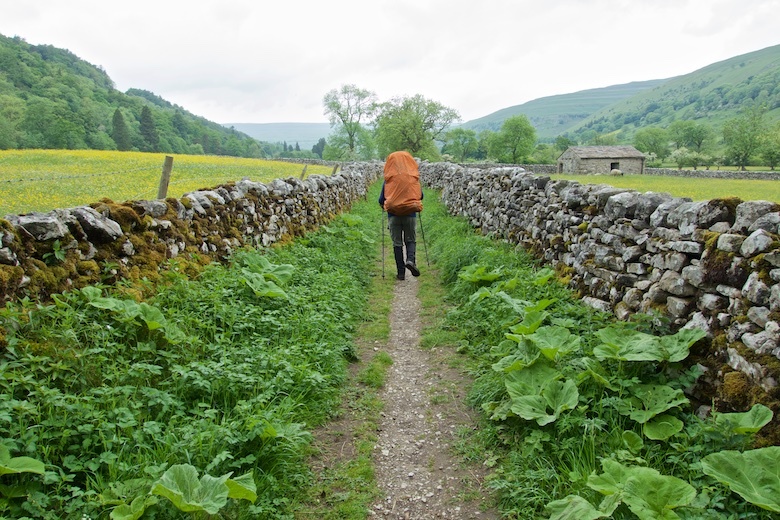 We were up and packed early again, heading for the landrover track that contours high above the River Swale. The sun was gradually winning its battle with the clouds, the scenery finally revealing itself. 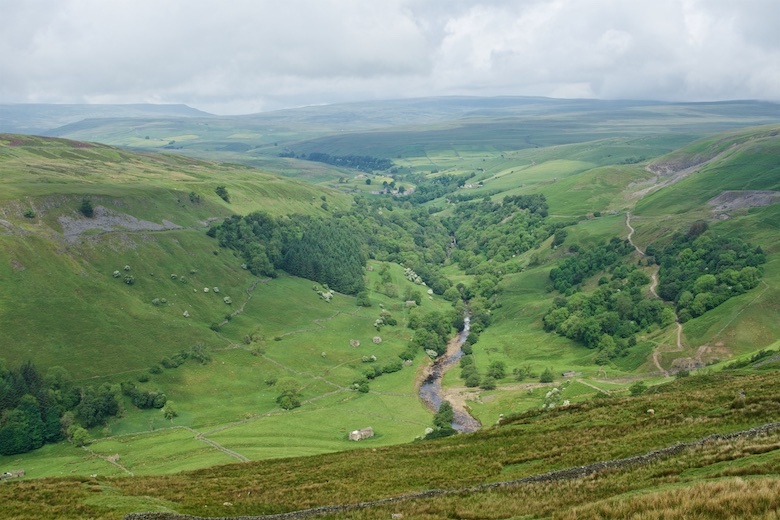 The view along upper Swaledale to Keld and beyond is an impressive one. 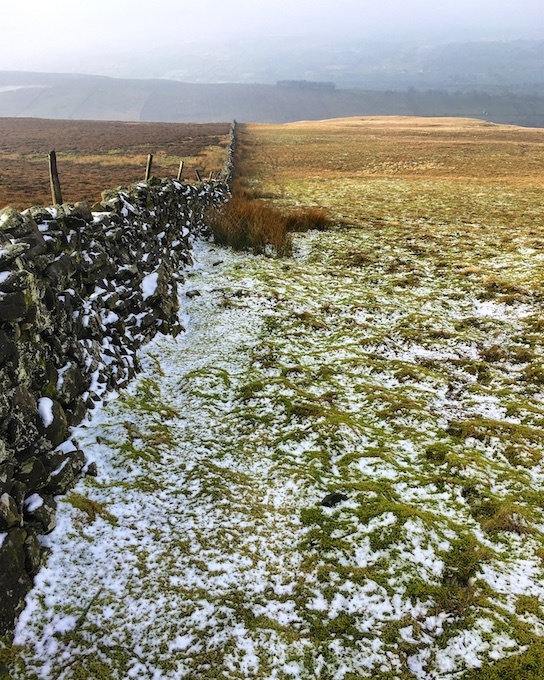 Nine Standards filled the horizon and we knew that we would have to climb over its high shoulder before we could descend to Kirkby Stephen and journeys end. 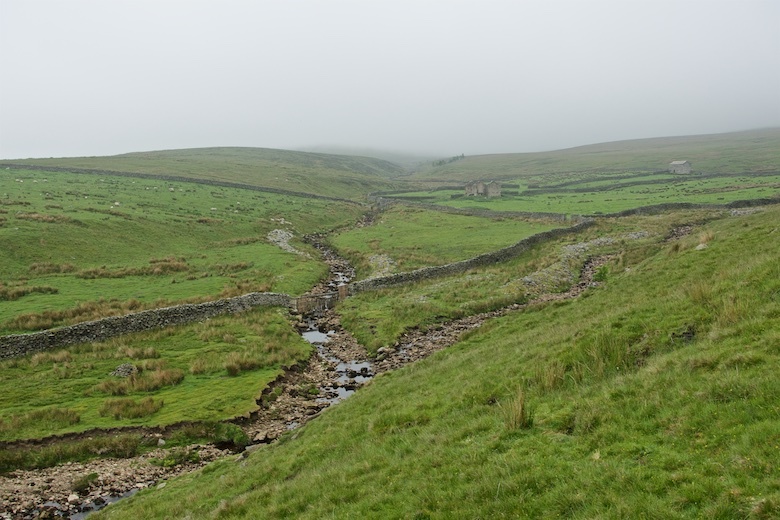 Whilst descending Swinner Gill we faced the tide of Coast to Coasters who must have set off from Keld that morning. It was a real international procession. 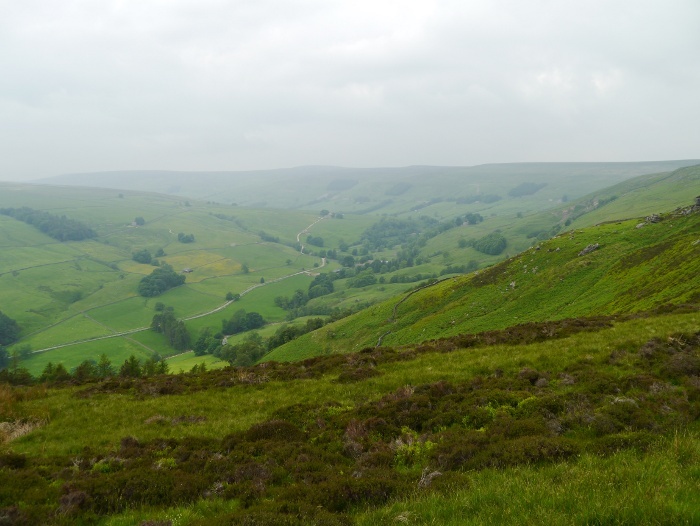 As we reached the outskirts of Keld, a familiar figure with two dogs waved at us from the hillside above. It turned out to be Chrissie’s husband Geoff, who I am disappointed to report did not have ice-cold cans of pop or any form of treat to share with us. I just got my face licked by a labrador instead. 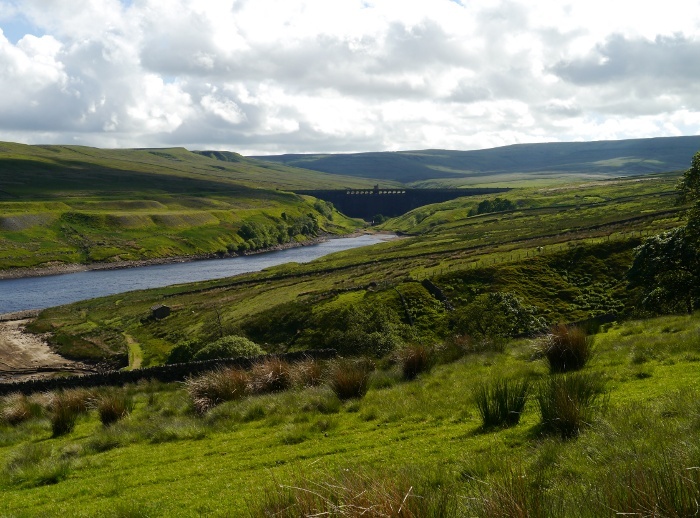 The remote farm of Ravenseat in Whitsun Dale was a hive of activity, with Coast to Coasters streaming in and out. The baggage transfer companies must be making a fortune as most only sported small day sacks. We shared a table with a couple of Americans whilst Chrissie demolished a cream tea with much vigour. The farm has been on the telly box a lot recently with the shepherdess saying the word ‘ewe’ numerous times in an exaggerated Yorkshire accent. 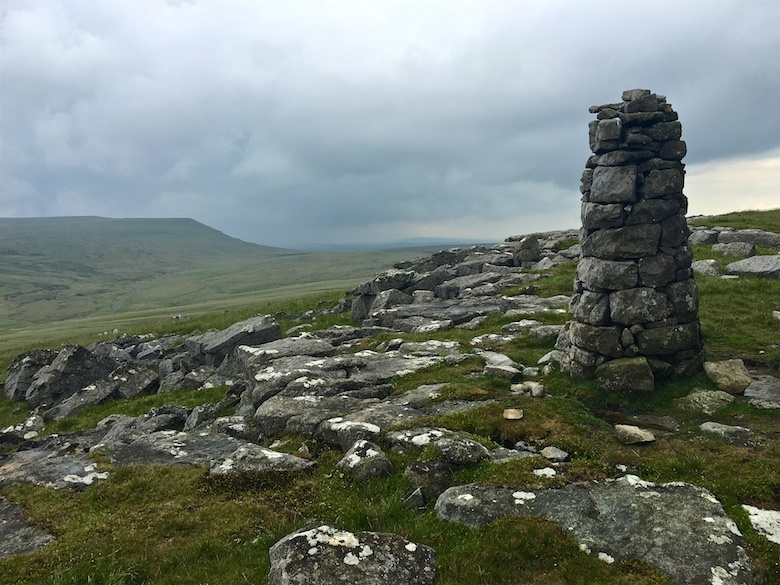 With rumbles of thunder in the distance we made our way along the Coast to Coast path up onto the plateau of Nine Standards. After spotting a funnel cloud we were ready to leg it to lower ground if the storm got any closer. It was a long and very boggy trudge. 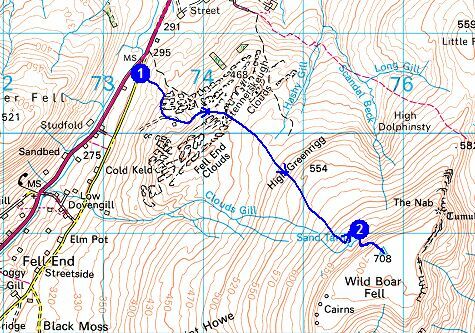 We missed out the summit itself, instead picking up a track over Hartley Fell and down to Ladthwaite. The rain finally put in an appearance and after walking through wet waist-high meadows there was no point in putting on waterproof trousers. The only memorable moment on the navigational challenging field paths to Nateby was a near death experience with a herd of frisky cows. They came charging at us at full pelt whilst we were far away from the safety of a fence. We stood our ground and shouted whilst waving our hiking poles, thankfully they changed course at the last moment. It was all worth it though when we finally reached the best tea van in Yorkshire for a large slice of much-needed cake. 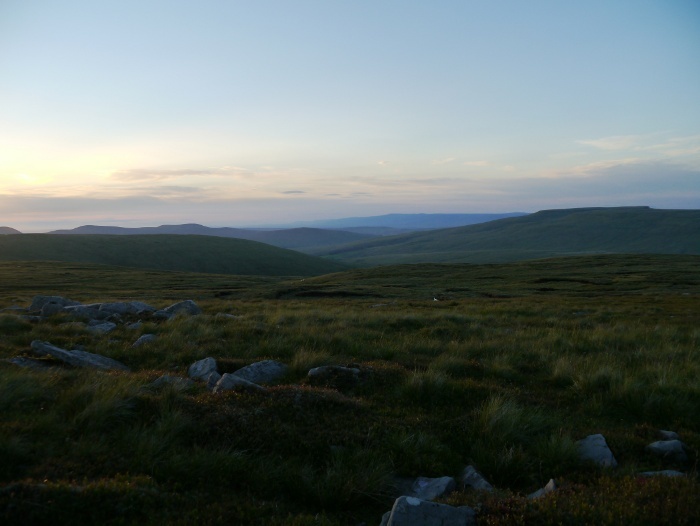 The last of the light was fading as I parked the van high on the moors near the Tan Hill Inn. I had set off from Nottingham in shorts and t-shirt but I found the breeze soon whipped away any semblance of warmth. 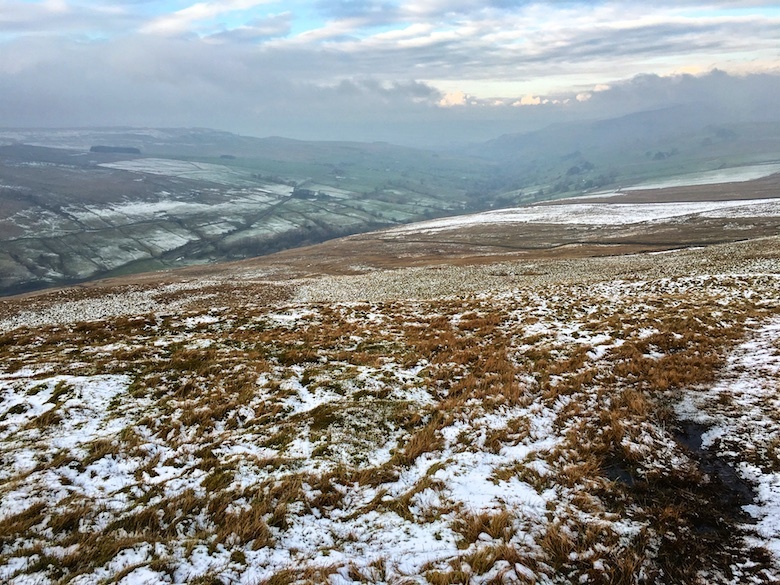 To the north, banks of cloud were rising and falling over the high escarpment, a wave of white covering the distant A66, muffling the sound of traffic. I made up the bed in the Doblo and lay there with the side door open watching the cloud lap upon the moorland shore. I had hoped for an impressive cloud inversion in the morning but it was not to be. 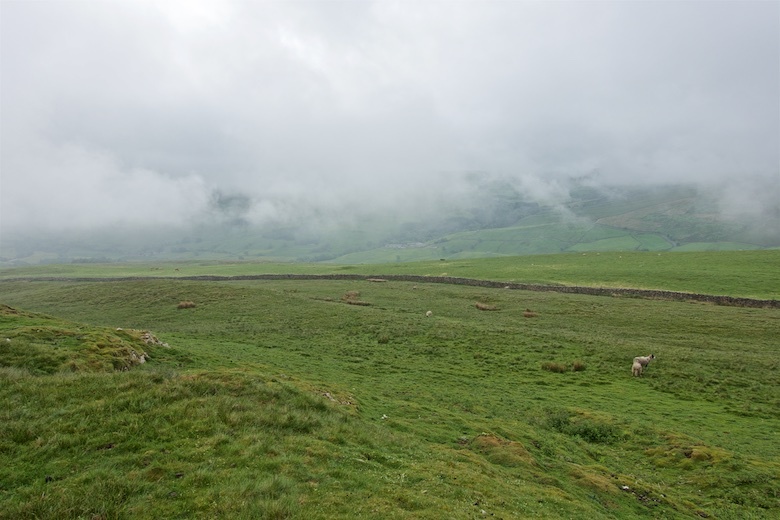 Instead it was a world of murk as I packed away the bed and pointed the Doblo in the direction of Kirkby Stephen train station. You would have thought that no one had ever seen anyone brew coffee and eat a bowl of bran flakes outside a railway station before. It probably is not the done thing. I had plenty of time to relax and sort myself out before catching a train south to Settle. 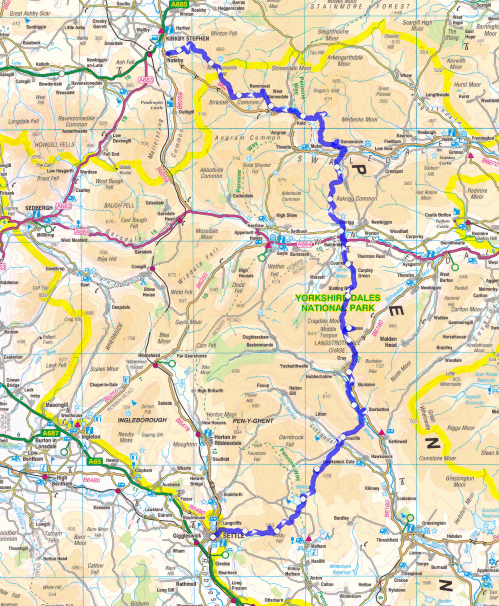 The aim for this long weekend was to meet Chrissie in Settle and then walk back through the Dales to Kirkby Stephen. A good leg stretcher and preparation for the Colorado Trail. 83 kilometres with 2700 metres ascent over four days. 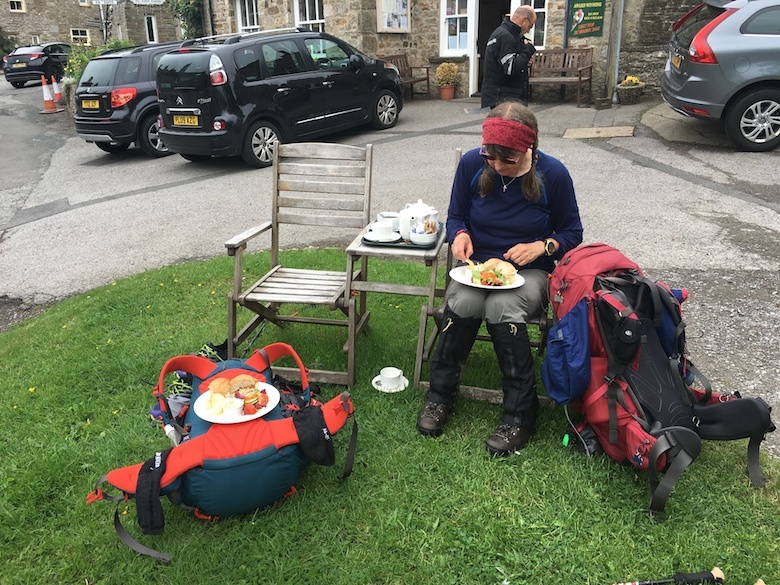 Chrissie and I started from the very busy Settle station and within minutes had stopped at a cafe to pick up cold drinks and lunch. There was not a cloud in the sky as we toiled up the steep track that would take us onto the limestone plateau. Even early in the day the heat was punishing. 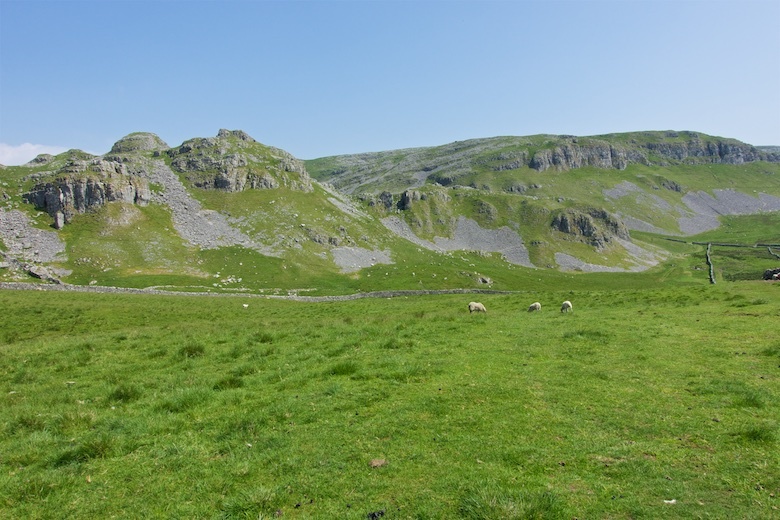 A path led us to the south of the impressive Warrendale Knotts and Attermire Scar, however it was far too hot to even contemplate exploring this area of limestone cliffs and caves. There was a minor bit of excitement where it looked like a cow had got itself tangled in a wire fence. 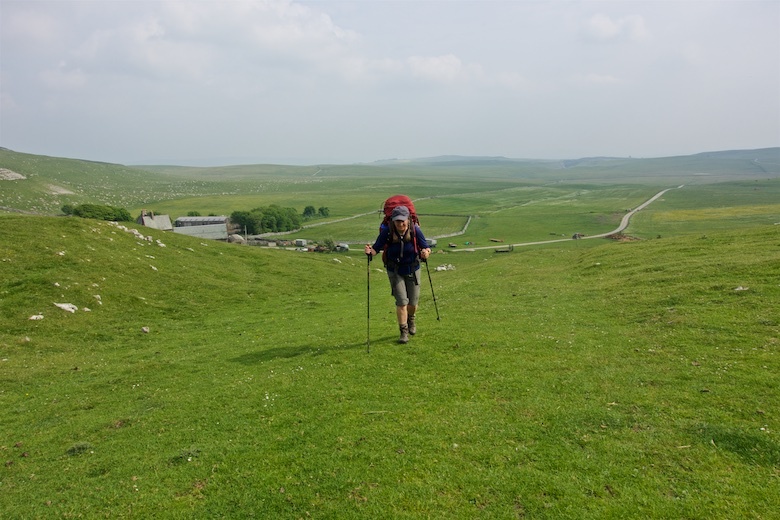 We dumped our rucksacks and bravely approached the hefty bovine beast ready to use our trekking poles for defence if we needed to. As we got close the cow simply walked away. It was all a ploy to make us look silly. 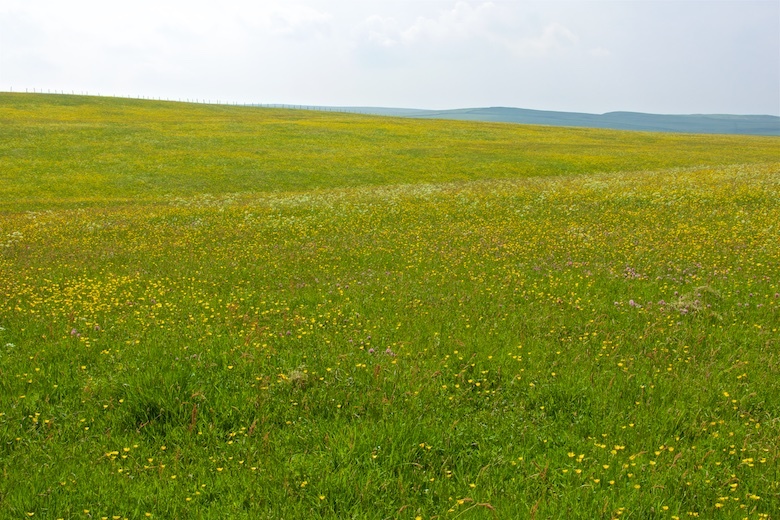 The Yorkshire Dales in early June is a riot of yellow with all the meadows in full bloom. It’s a stunning sight, although not the best when you suffer from hayfever. 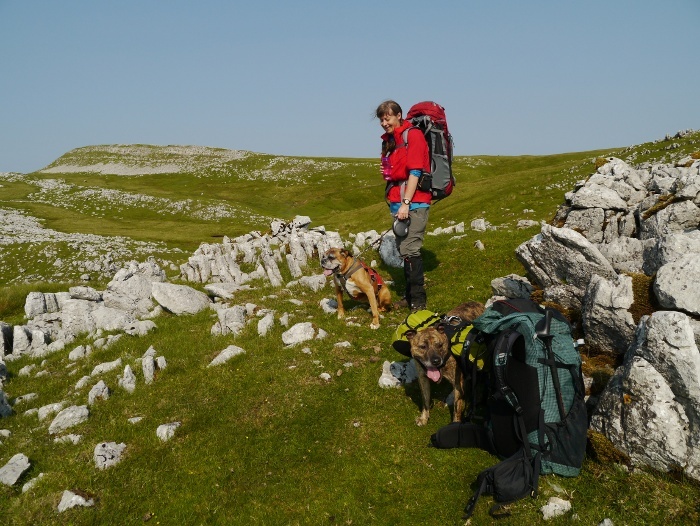 When trekking in limestone country in hot and dry weather you need to bring along someone with a large and effective water filter. 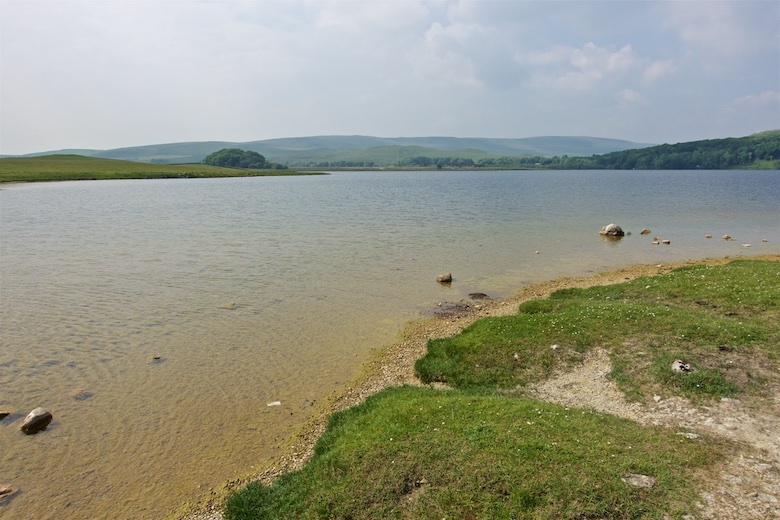 Chrissie fitted the bill nicely in this respect and we were soon drinking cool and clear water from Malham Tarn. It meant that I could leave the nasty chemicals in my pack. 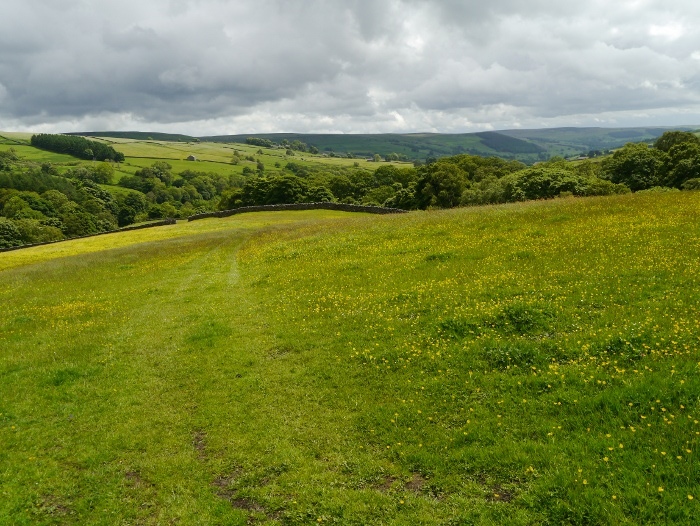 The honeypot area of the tarn was left behind as we climbed past Middle House Farm and onto the old track of Monk’s Road. the idea was to follow it for a while and then pitch at a spot where I had my fingers crossed there would be a trickle of water. Sadly the trickle had dried up leaving just the odd puddle. 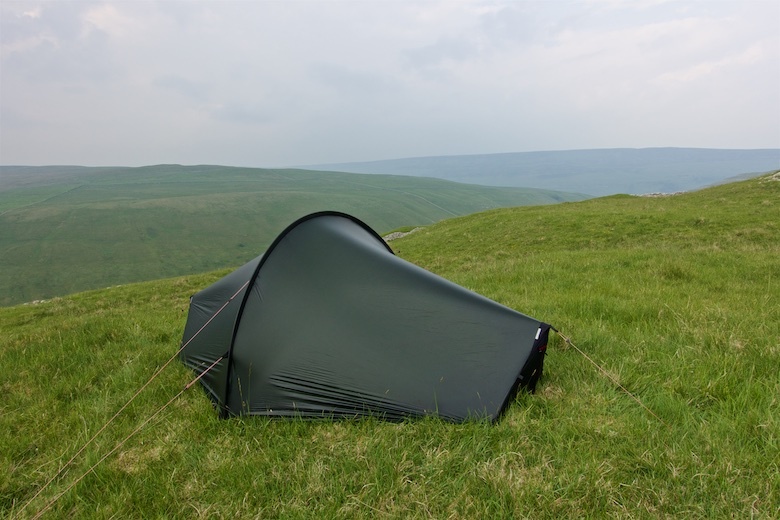 Chrissie’s super filter made short work of this and we found a grassy pitch nearby with great views over Cowside Beck. The grass was fragrant with herbs, the most pleasantly scented pitch I have ever had. The sky began to darken, haze slowly blotting out the views. It was close and muggy and I kept my fingers crossed that it would not storm. A light rain fell during the night and the humidity was ramped up to what felt like one hundred percent. My sleeping bag had remained unzipped throughout the night. Early the next morning wet tents were packed away and we walked back up to the Monk’s Road which was followed down to Arncliffe. It was too early for the pub so we sat at a picnic table on the village green and ate snacks whilst a soft rain fell. Even standing still I felt like I was suffocating in my waterproofs. Neither of us was looking forward to the long climb over Old Cote Moor. As if reading our minds the weather gods looked down at our discomfort and punished us the best way that they could by giving us a heavy downpour. 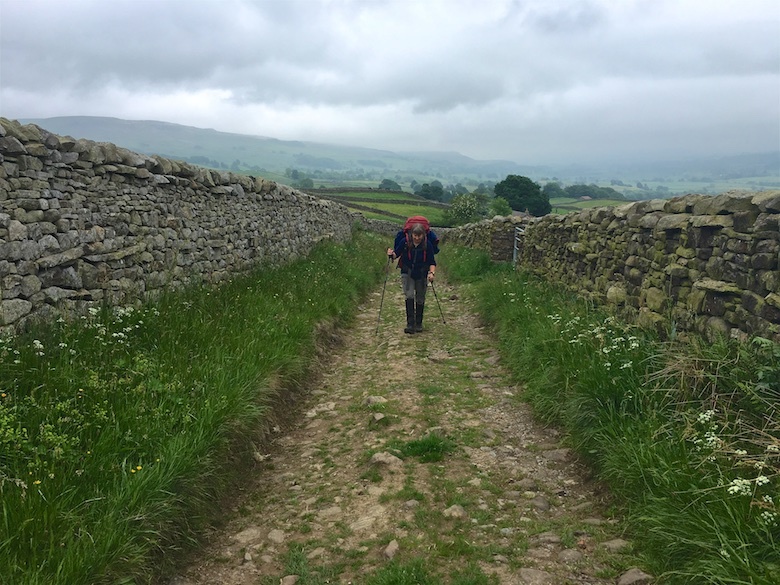 I was soaked inside and outside my hard shell as we crested the moor and dropped down into Wharfedale. Chrissie said that there was an excellent cafe in Starbottom but it failed to materialise, I hid my inner tantrum well. Instead we were the first people to visit the rather frosty pub where we dripped all over the floor and squelched to a seat by a window. It stopped raining for the full hour that we were inside. Pints of sugary coke and a big bowl of chips lifted the spirits. 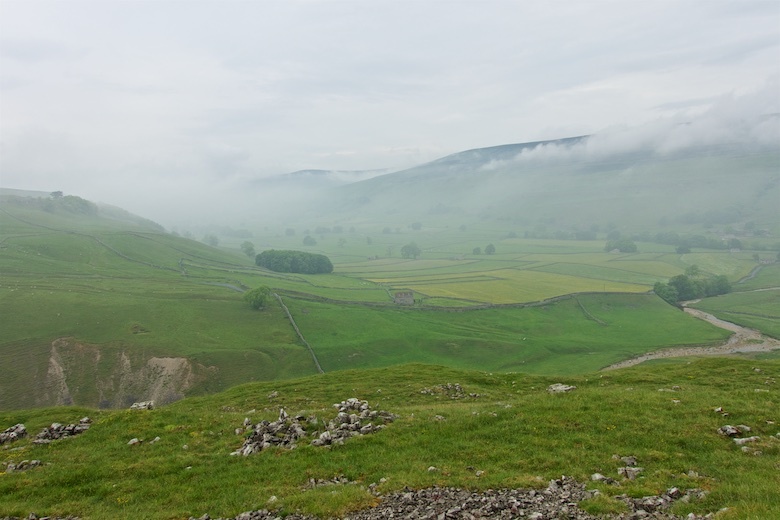 The Monsoon rains hit us on the outskirts of Buckden, just as we has started climbing again. It was heavier than any rain in the UK has the right to be. I consoled myself with the fact that I was not as miserable as Chrissie looked. 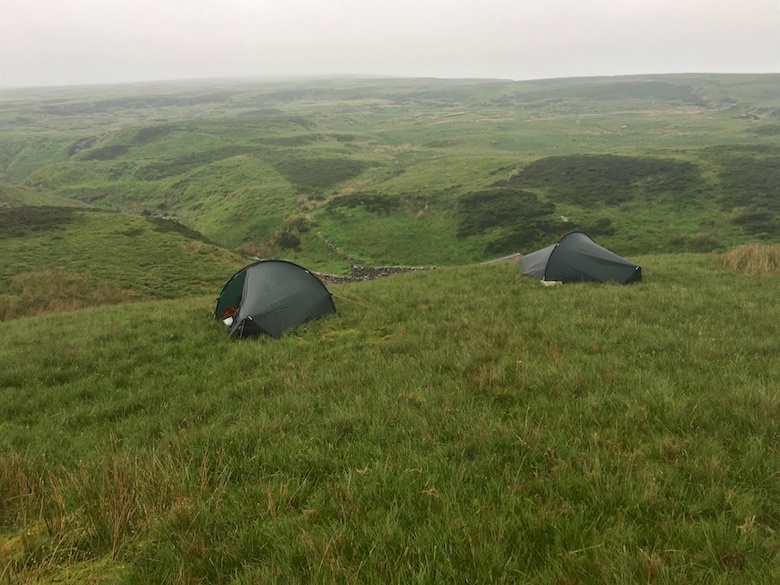 With the power of Google maps I had located an idyllic looking campsite on the moors above Cray. A nice grassy swarth next to a meandering stream. Google maps however failed to show the thistles which covered every inch of the close-cropped turf. 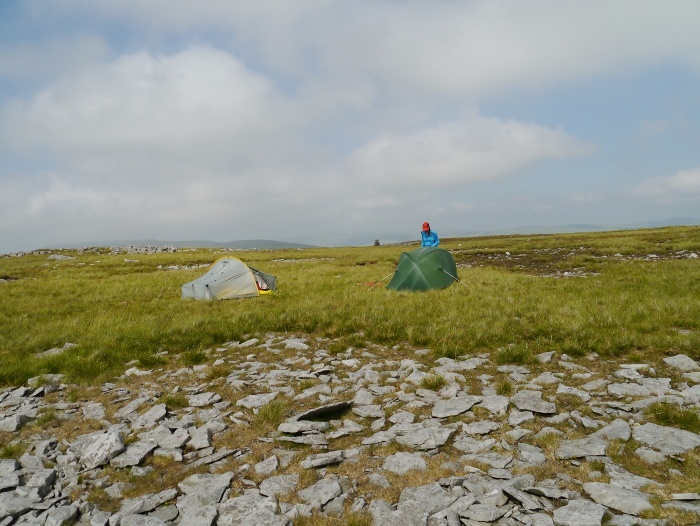 We therefore filled up our water bottles and tramped back up hill to a more exposed pitch. 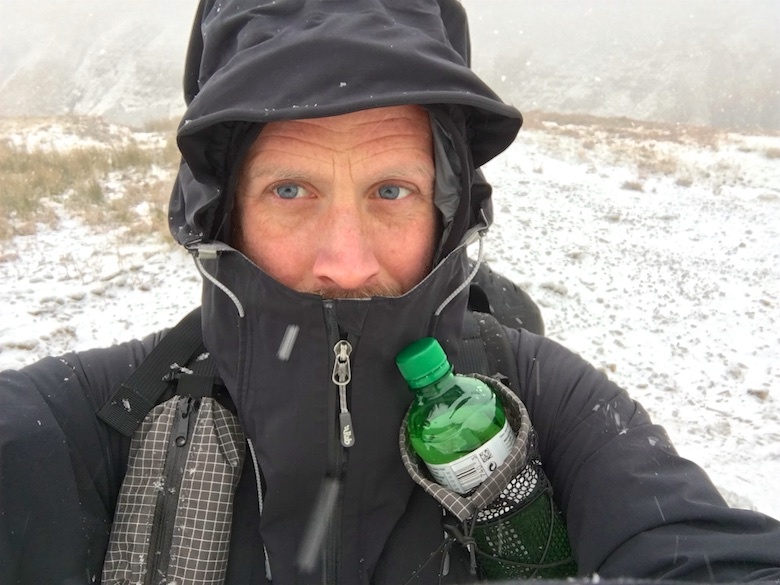 It was good to change out of sopping wet clothing into my tent outfit, it’s good for morale to know that dry clothes await in the bottom of my pack. Another very warm and humid night followed, with barely a breath of wind to keep the condensation at bay. I wasn’t looking forward to putting wet clothes back on the following day. Part 2 will follow shortly (ish). You can read Chrissie’s version of events here. 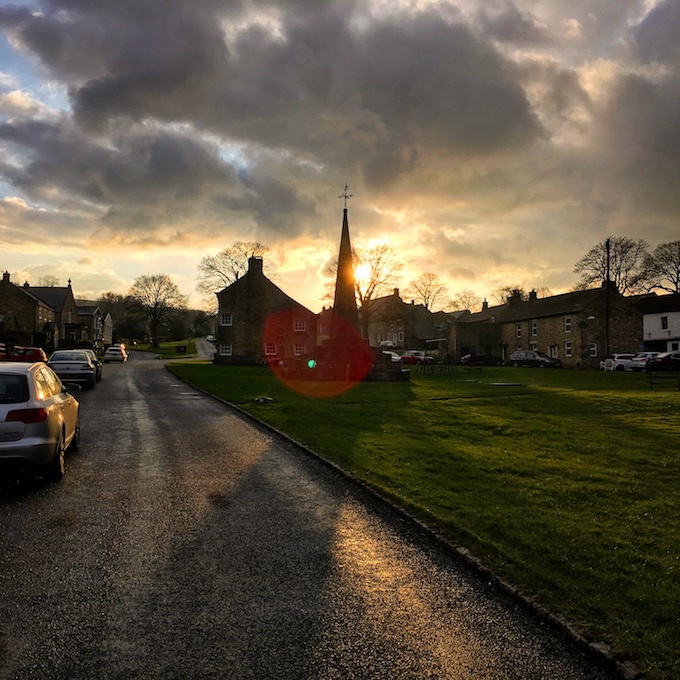 West Burton is one of those picture perfect Dales villages, stone cottages surrounding a large village green. The only thing spoiling it was the long line of cars parked along the narrow road. I added to it, leaving the Doblo overnight as I headed up the Dale for a horseshoe walk around Walden. I really want to call it Walden Dale because it is a Dale and a fine one at that. 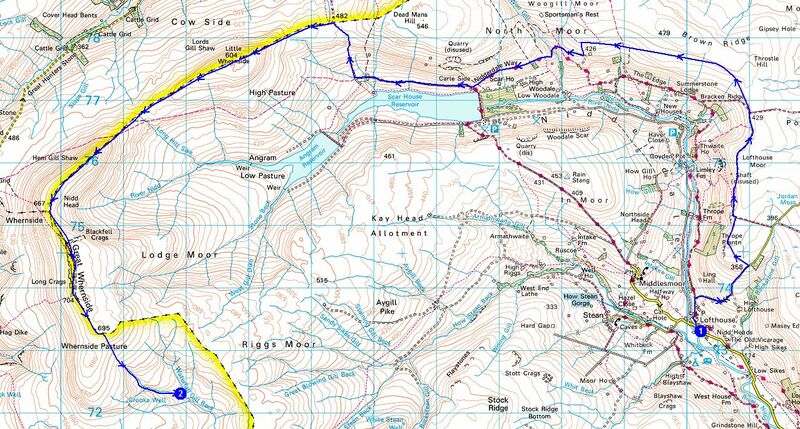 However the OS map simply has the words ‘Walden’ in the middle, so Walden I will call it. It was one of those filthy late winter days, cold, grey and murky. The tops of the hills were invisible, much of the views obscured by haze even in the valleys. 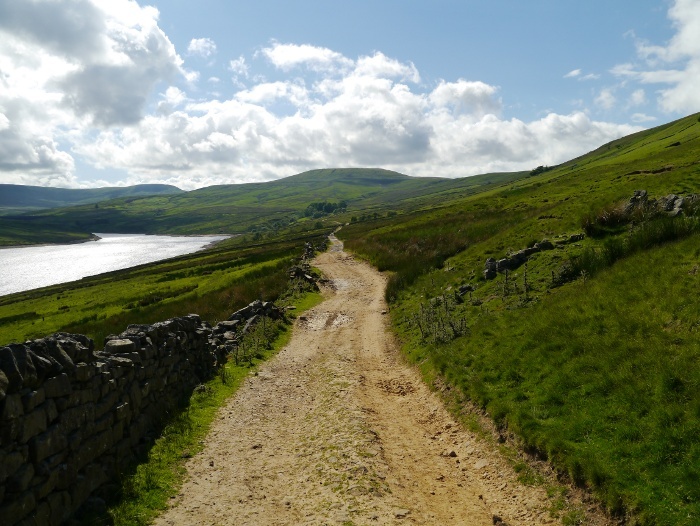 I set off along wet tarmac before squelching my way up a bridleway and onto Carlton Moor. There is a Carlton about half a mile away from where I live in Nottingham. 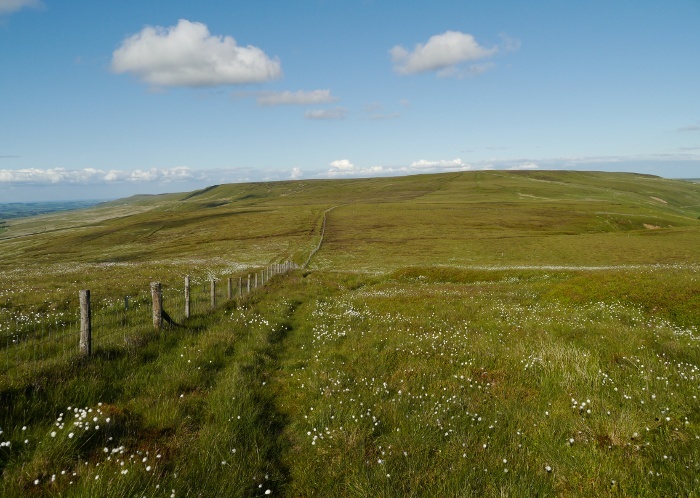 Sadly there are no drystone walls, moorland grasses whispering in the wind or fresh invigorating air there. 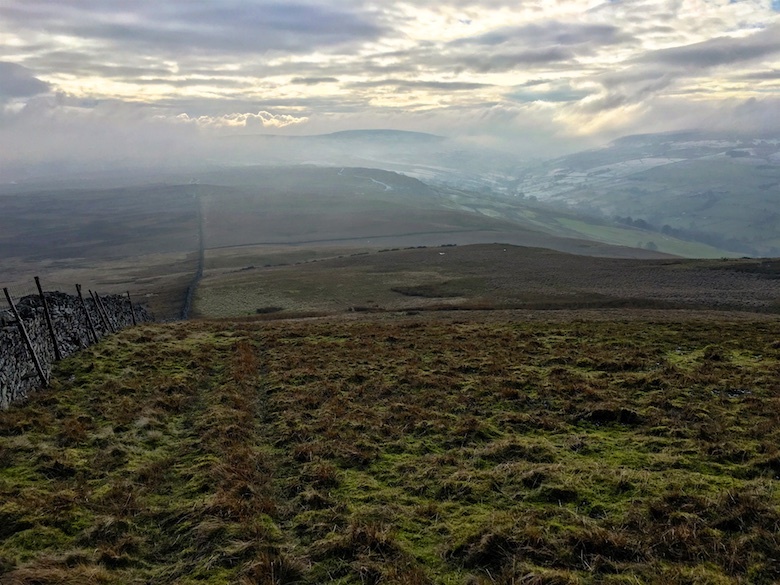 I caught my breath on the summit of Harland hill, just in time for the murk to part for a while. My weekend route was at my feet, painted like a faint watercolour, soft greens and greys, the sun providing no visual warmth. 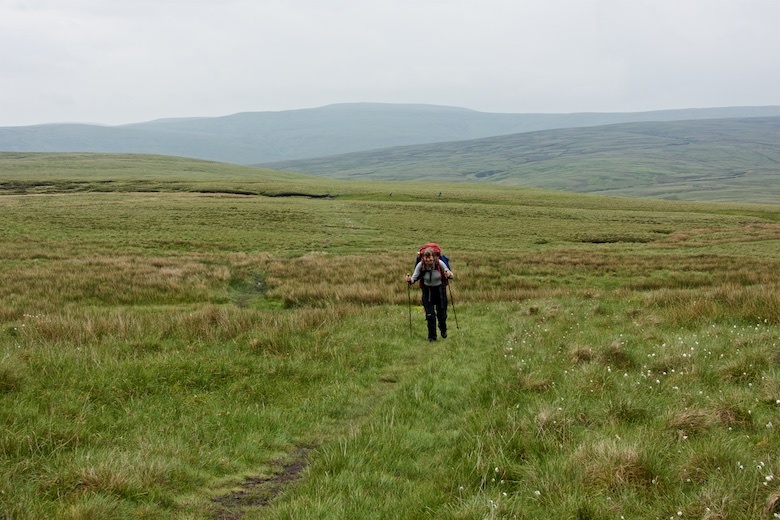 It’s a long moorland trudge following the watershed to the summit of Brown Haw. 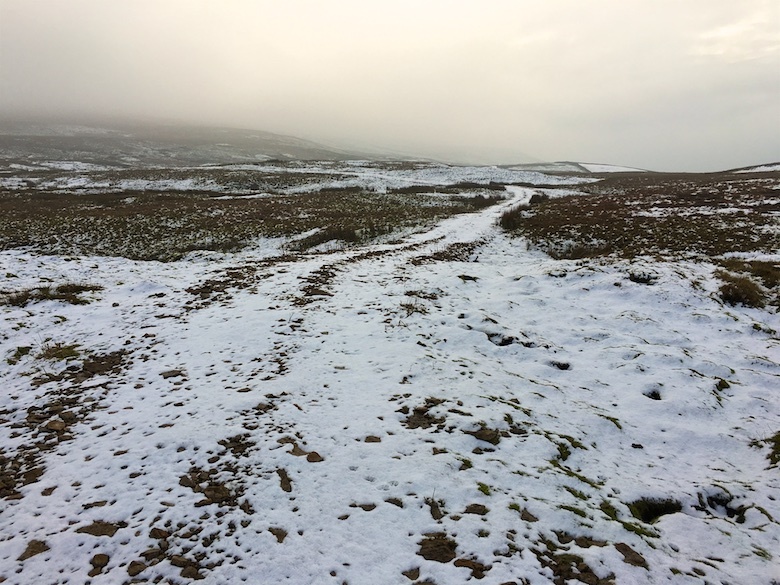 Instead I dropped down to the north and followed a landrover track as it wound its way through an increasingly snowy landscape. I eventually had to leave the comfort and security of the track and the easy progress that it provided. A thin sheep trod took me upwards and onto the summit . 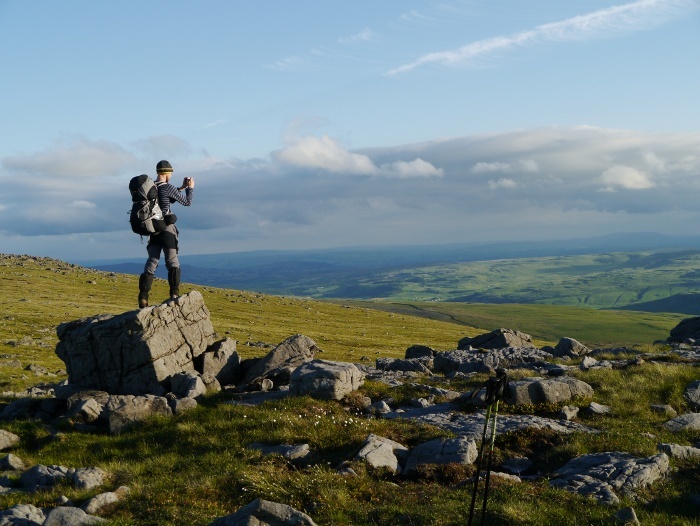 The views once again briefly opened up, this time with Walden widening out to the north towards Wensleydale. Brown Haw was defended from the north by a brand new and very sturdy fence. That in itself would not normally be a problem as without barbed wire fences are easily hopped over by the long-legged. The problem was the following garish sign that was posted every few metres, a big long danger zone snaking off into the mist. This provided me with a bit of a dilemma. Did I want to risk being sterilised as I attempted to step over? There was no stile or crossing point in view in either direction. 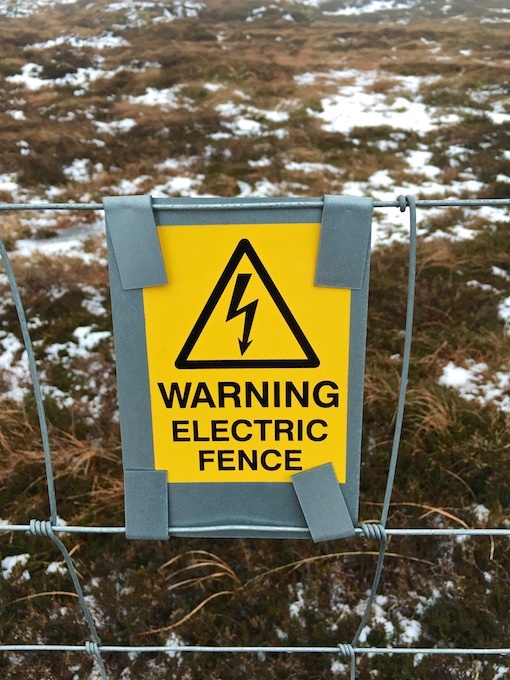 As I child growing up in Suffolk one of the challenges we undertook was seeing how long we could hold onto an electric fence for. Therefore I took a deep breath and, nothing. There was no shock involved. In the end Brown Haw was a bit of an anticlimax. 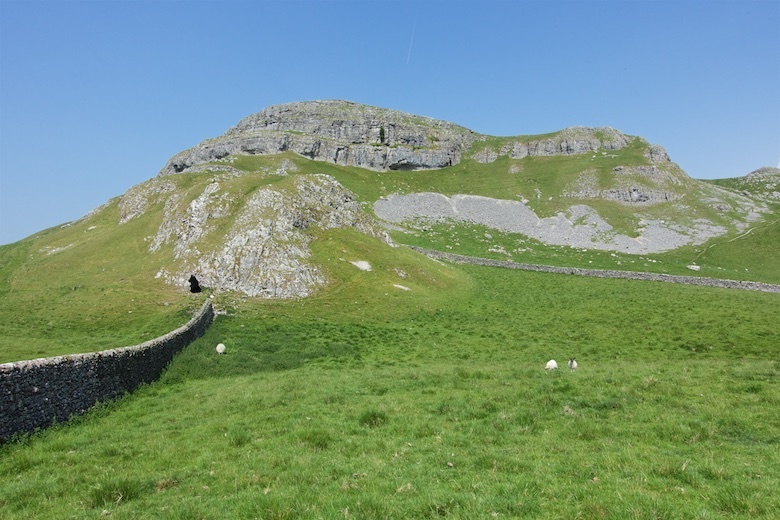 With dusk arriving early I soon found a level pitch at the head of the dale, an area of limestone providing good firm grass. It soon got cold, a damp chill in the air and I was glad to get into a nice warm winter sleeping bag. A light snow fell in the night and I awoke to a thick mist, the snow emphasising the general gloom. 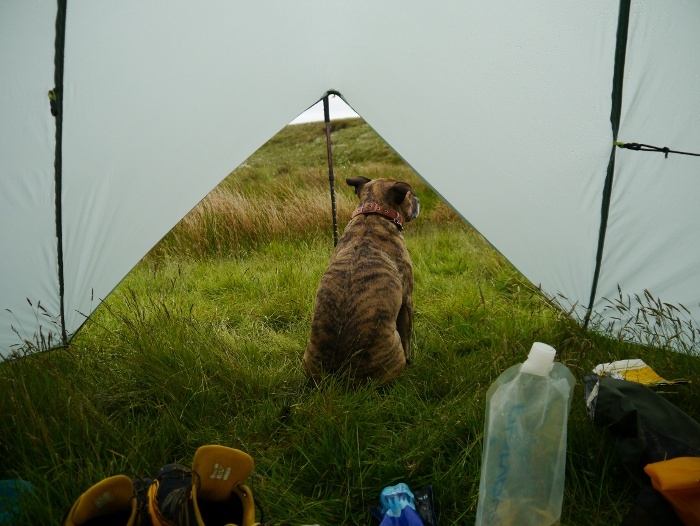 It had been still, cold and humid leaving the inner tent dripping with condensation. 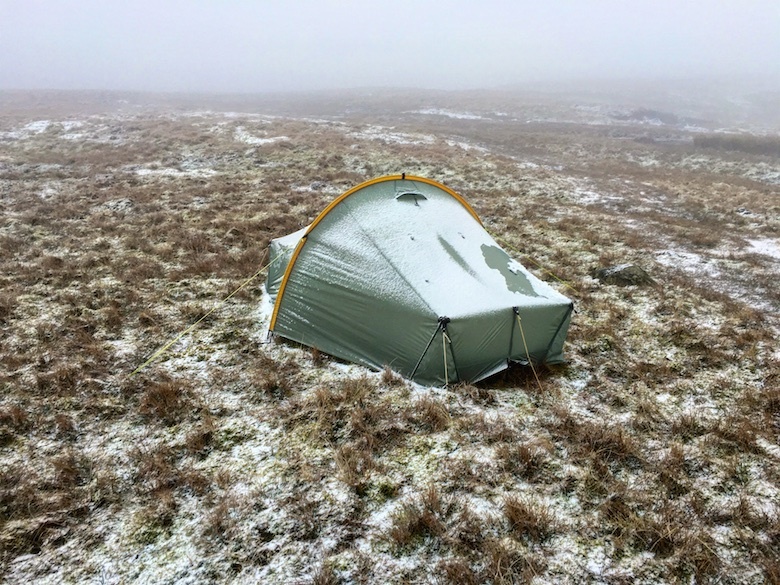 I was warm and snug inside my sleeping bag but the warm air from my body had reached the outer which was soaked due to the dew point being reached. 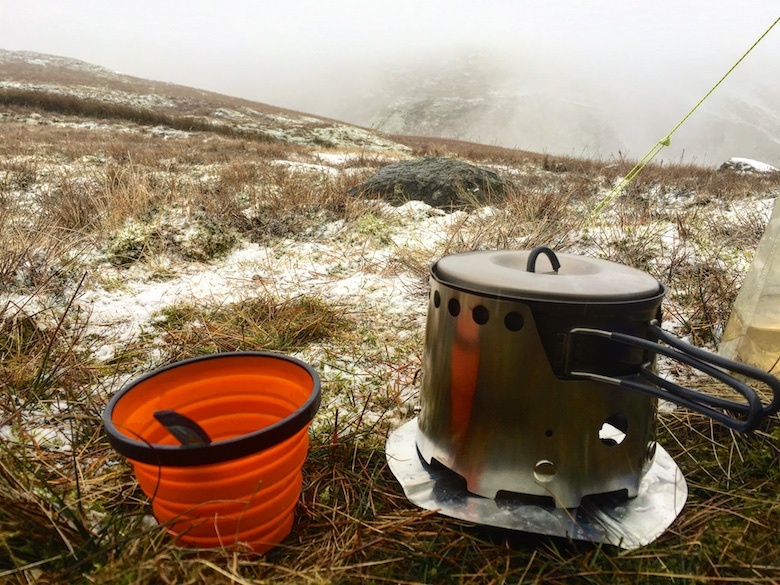 I love wild camping mornings, the ritual of waking up in the wilds and making a brew whilst snug and warm in bed. It was the first time I had used an alcohol stove for many years. I had decided to get a Flatcat Bobcat Jr to take to Colorado in the summer. On its first use I was impressed at just how fuel-efficient it is, although it is much slower than using gas. Once packed and walking the cloud level lifted for a while and I began to get hopeful that it would clear as forecast. Alas this was not the case and much of the rest of the day was spent walking with heavy snow blowing in my face, visibility often falling close to zero. 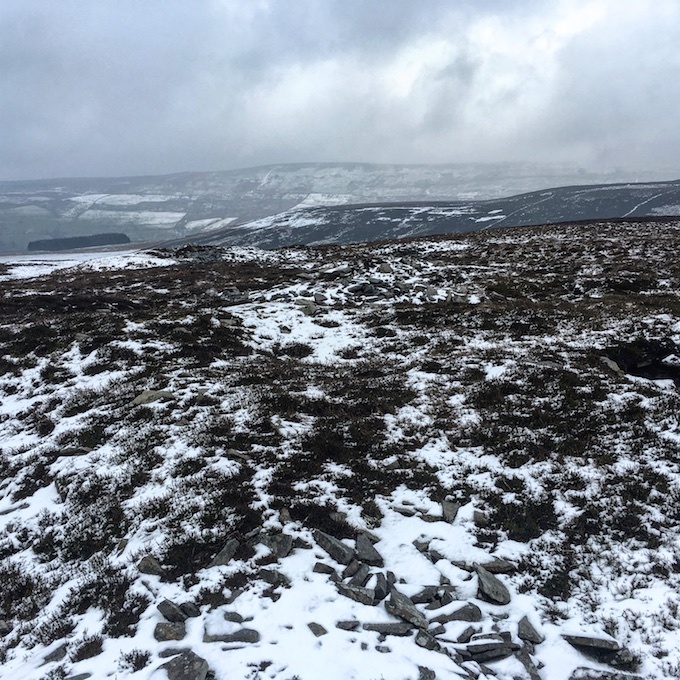 Rather than climbing to the summit of Buckden Pike I stuck to the landrover track for a while before finally striking off up rough slopes to the summit of Naughtberry hill. From there to Wasset Fell the going was probably the least fun way of spending part of a weekend. 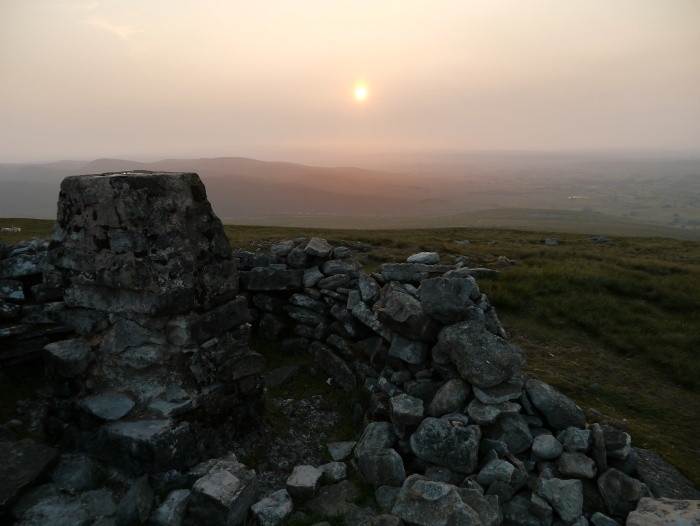 A shooting hut was marked on the map at Wasset Fell but it was clear it had fallen down years ago. Instead I stood on the exposed fell and shivered whilst I wolfed down some food. Floutgate scar provides a bit of drama, the end of the high moors before they drop into Bishopsdale. In the distance I could just make out Castle Bolton in Wensleydale, the castle itself illuminated by a brief shaft of sunlight. 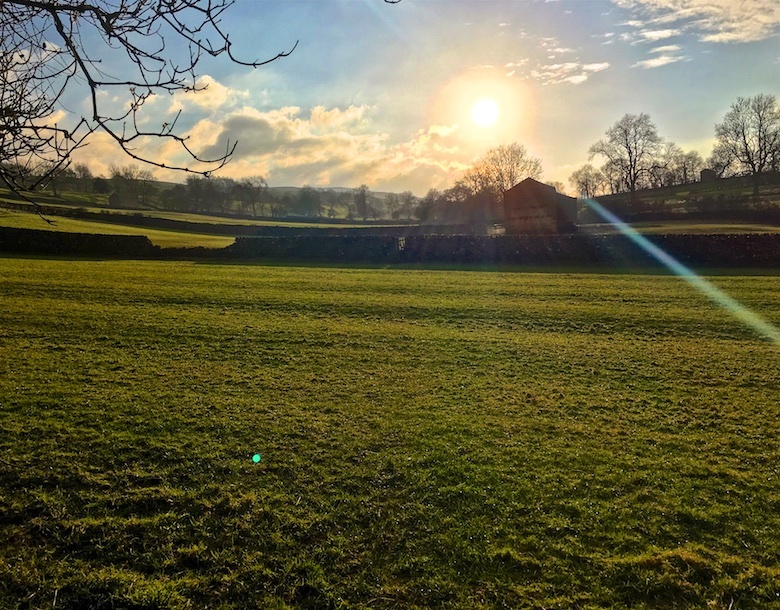 Spring finally arrived as I crossed the fields in the dale, the sun chasing winter away. 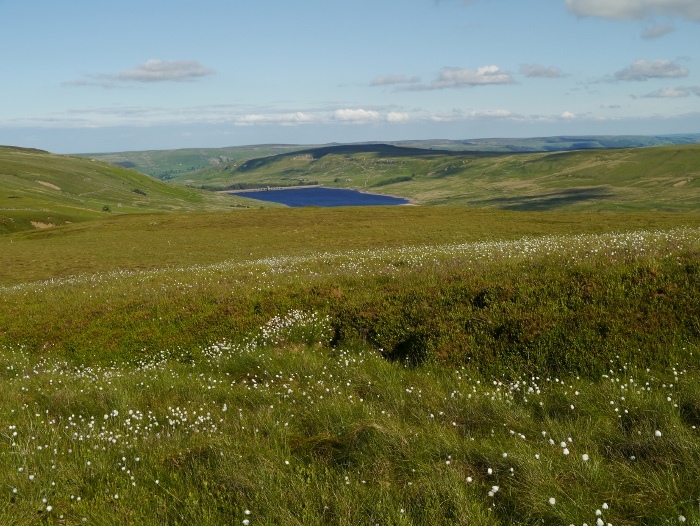 The contrast between moor and valley could not have been greater. Once back at the van in West Burton the sun and clouds had a brief atmospheric battle before once again the clouds took control. 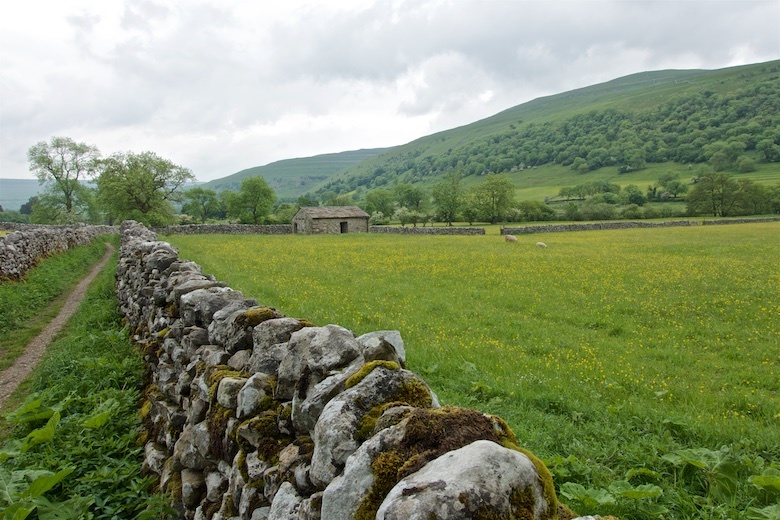 It was late afternoon when I parked up off a minor lane in a scenic spot opposite the Howgill Fells. 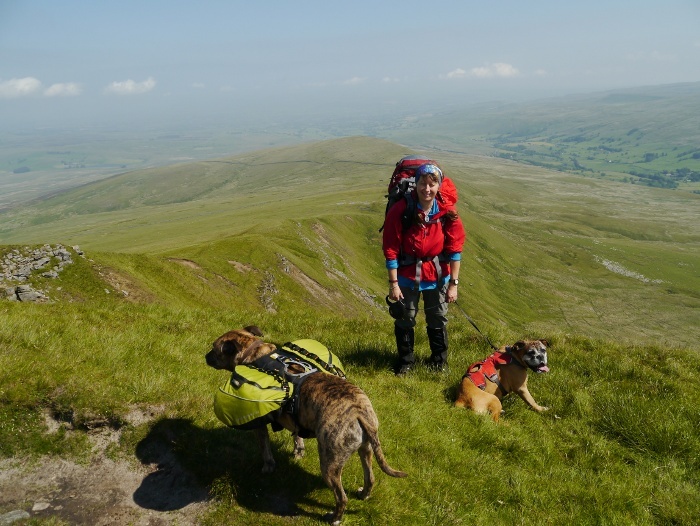 I had picked Chrissie and Dixie up from the Western Peak District after she had finished work. Somehow we had avoided the Friday rush whilst escaping Manchester. The weather forecast for the weekend was for hot sun and no rain. A bonus for us humans but not so good for our canine companions. 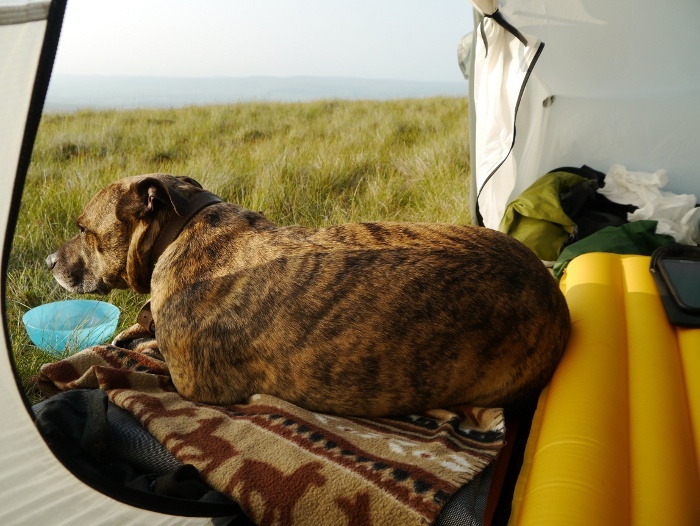 Therefore with Dixie and Reuben in tow the plan was for short days and extended lazy periods whilst camping high on the moors. 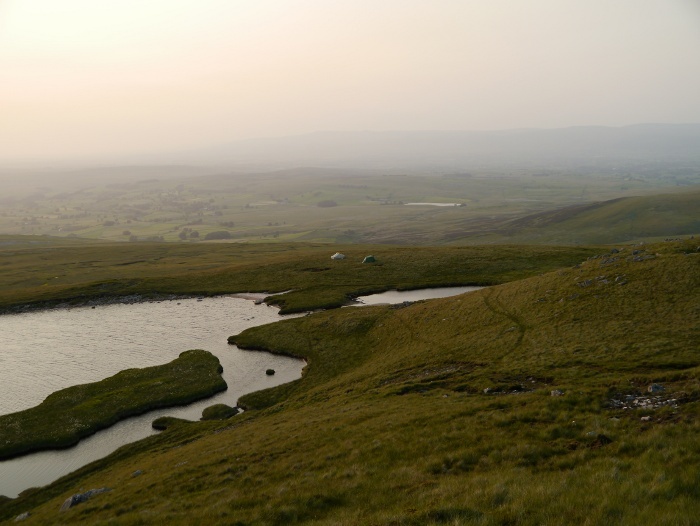 Our destination for the night was Sand Tarn which nestles below the western summit of Wild Boar Fell. 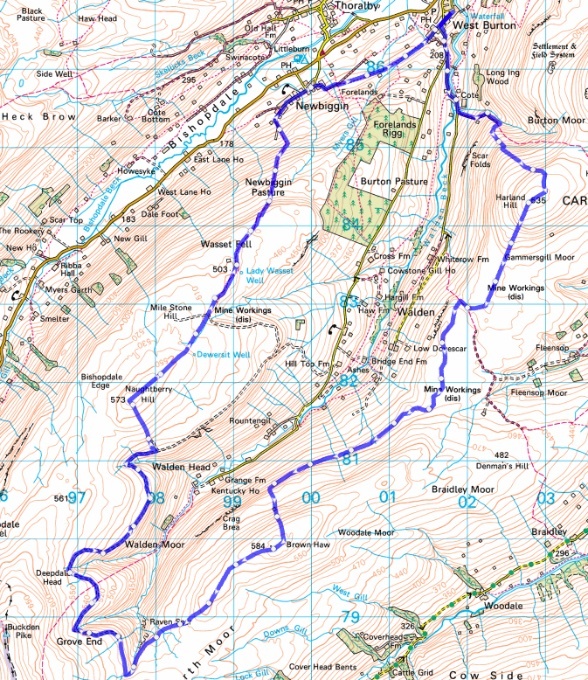 The distance was short but the amount of contours between the car and tarn meant a big climb. The limestone boulder clad Stennerskeugh Clouds provided interest, before a plod across boggy moorland. 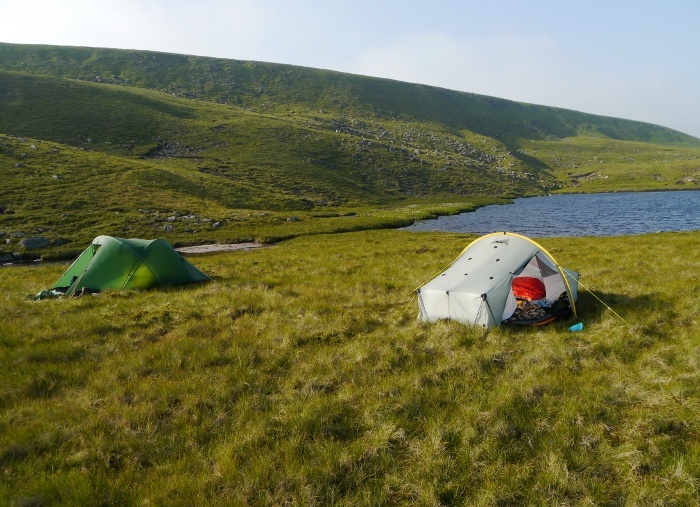 There was a welcome wind when we reached the grassy shelf next to the tarn. Tents were quickly pitched, boots kicked off and brews made. It was good to lounge around the tents and enjoy the location. With lounging duly accomplished I spent a while simply wandering around our campsite, enjoying the surroundings in the early evening light. 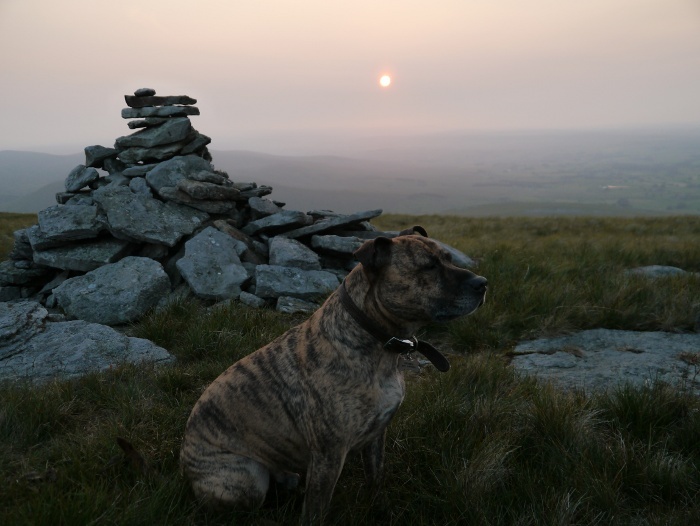 After dinner I was keen to do some further exploring so set off with Reuben to the trig point on Wild Boar Fell. We managed to spend over an hour to do the short return trip. Every few paces I found myself transfixed by the changing colours under the setting sun. The Howgills slowly turned to the softest velvet. The sun as it descended was a tiny red disk amongst the haze, slowly fizzling out as the cloud overwhelmed it. The wind had finally dropped leaving just the sound of moorland birds and the bleating of sheep. 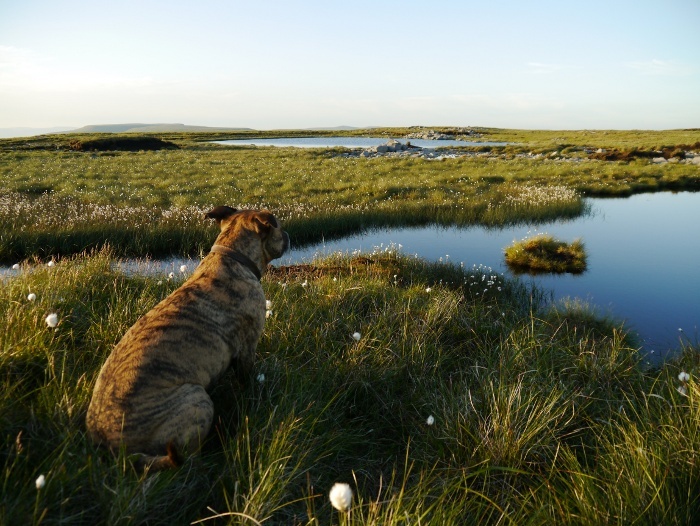 A great moment shared with the dog on the edge of the high plateau. Sunset still comes late in July, so by the time it was dark I was more than happy to go straight to sleep. In the tent I finally lost the battle with Reuben over which sleeping mat was his. He wanted the one that I was laying on. 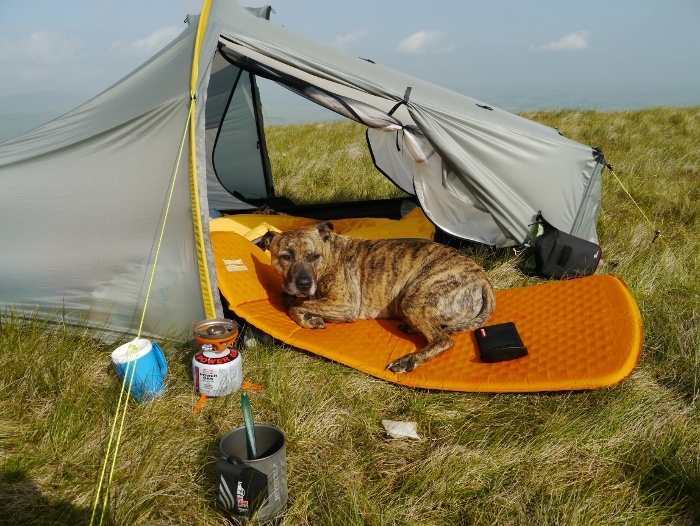 The inner of a Scarp is a bit of a squeeze when sharing it with 25kg of fur and muscle. 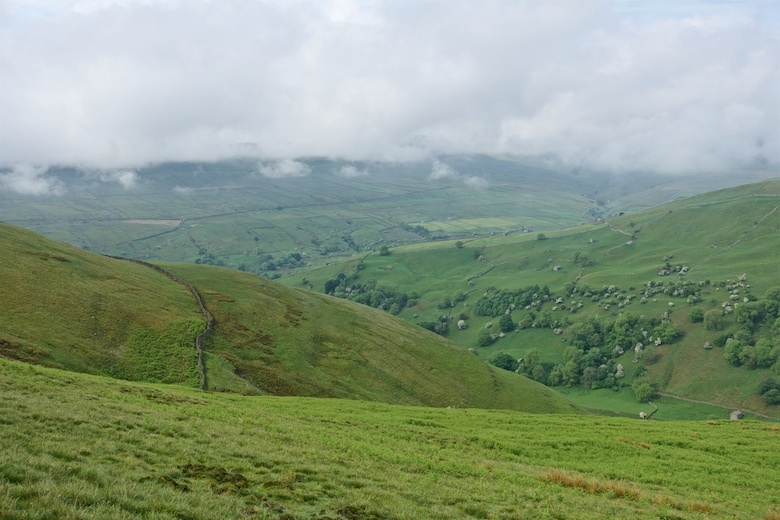 The haze did not shift overnight and the Howgill Fells across the valley were hidden under a blanket of cloud. Every now and then the sunshine above us would disappear as banks of mist drifted by. We managed to keep up the relaxed theme by lounging outside the tents until mid morning. It would have been all too easy to have spent the whole day just reading and paddling in the tarn. Finally by late morning we managed to pack up. 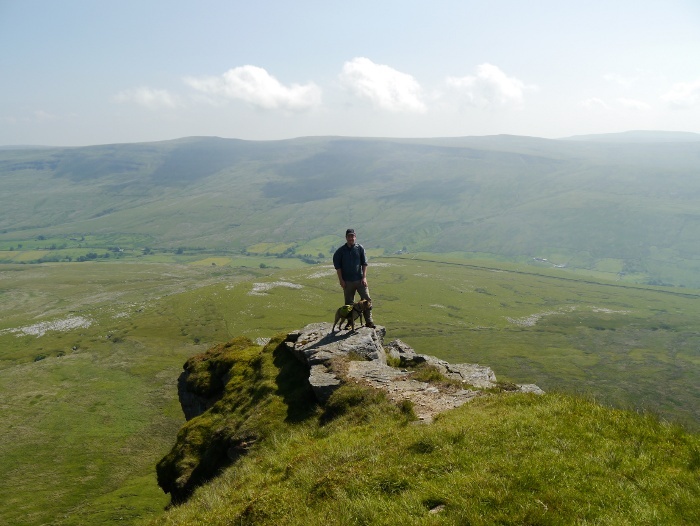 I was keen to show Chrissie the Nab on the Northern edge of Wild Boar Fell. 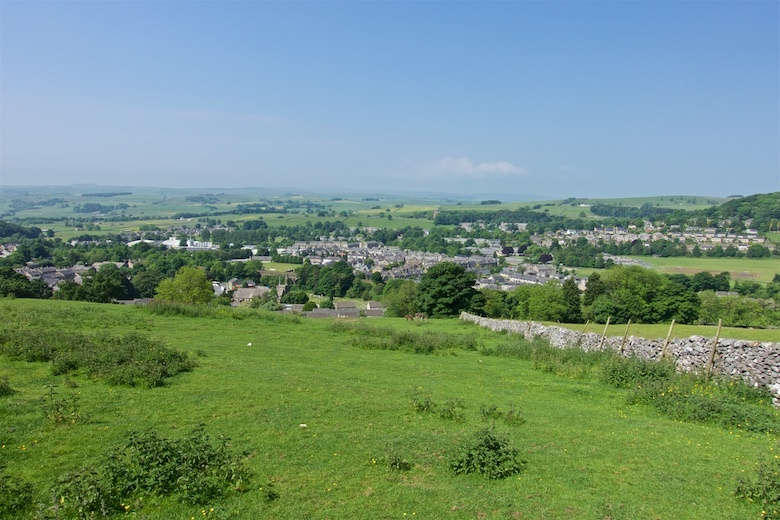 It is one of the best viewpoints in the Dales, giving an impression of being high in the mountains rather than on featureless moorland. 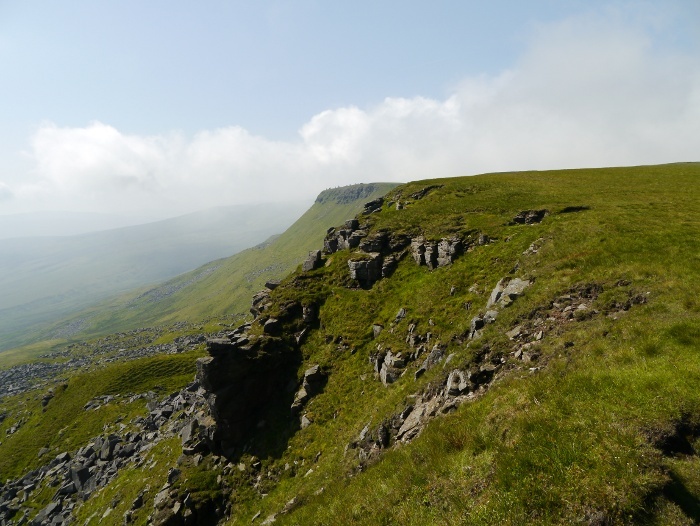 The escarpment drops steeply down into the Mallerstang valley, a finger of land giving a sense of exposure. The dogs had to be kept under close control as they were keen to get as close to the edge as possible. The escarpment gave a grand promenade, dry cropped grass keeping the feet happy. 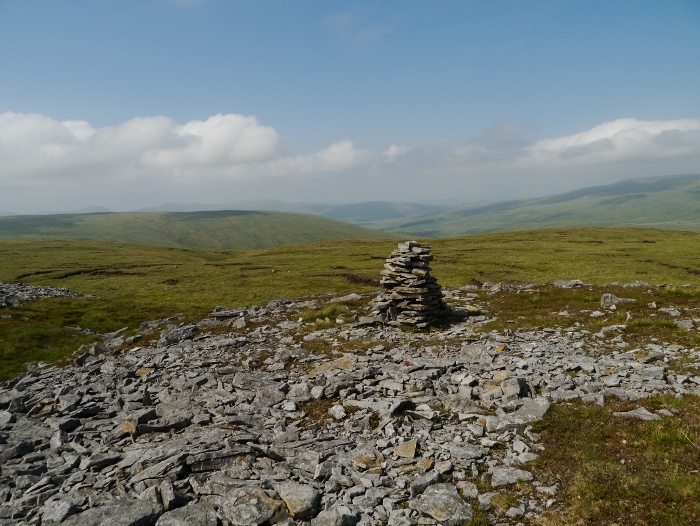 We were heading for a group of cairns in the distance, giving the impression that they were people. Reaching them they made a good foreground feature on which to photograph the escarpment in full. 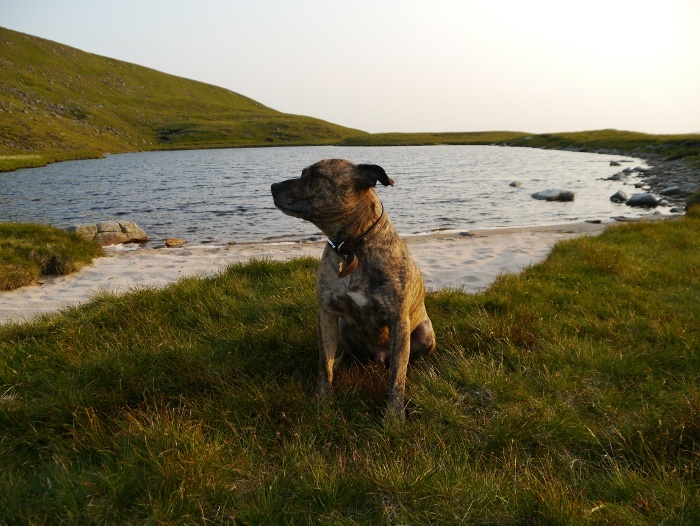 However if there is no cairn I can highly recommend taking a Reuben with you as he is more than happy to pose. For full effect you need a bit of a breeze to make his ears flap around. 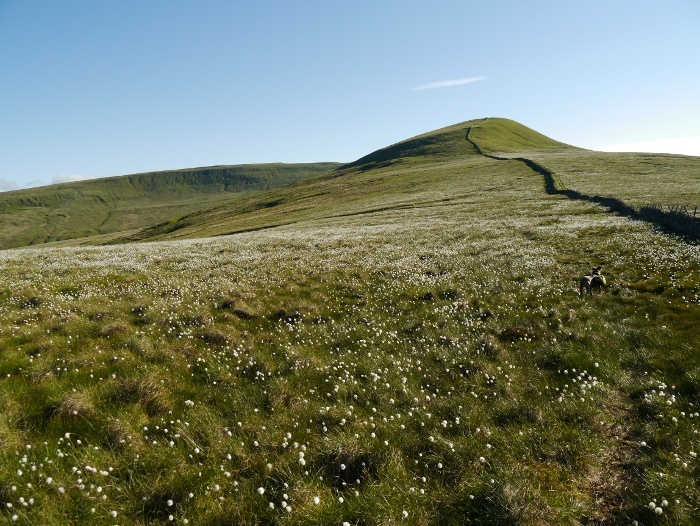 It was an easy walk to Swarth Fell on a grassy path, the bulk of Wild Boar Fell showing itself on the climb to the summit. We sat for a while on the summit rocks to have lunch number one (all good days out have at least two lunches) enjoying a cooling breeze. A large group of walkers following a woman with a fluorescent tabard passed, the last people we would see all day. Following the wall we took a right angle and headed directly for Holmes Moss. 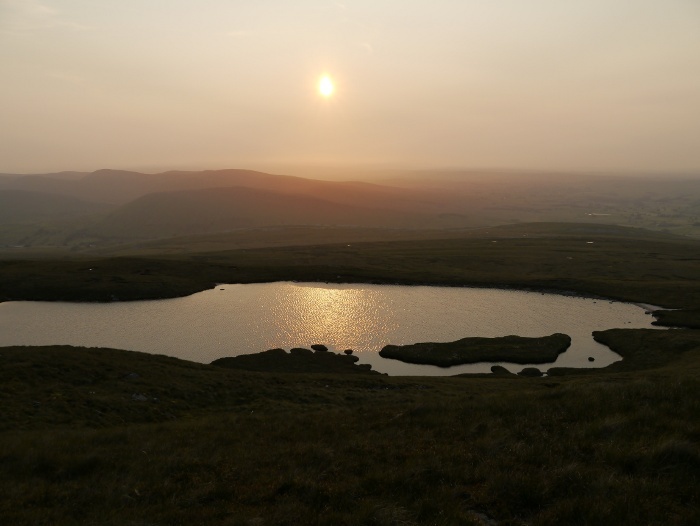 Our destination for the night was to be Baugh Fell and we were aware of the long descent followed by a long ascent. Something neither of our legs were looking forward to. 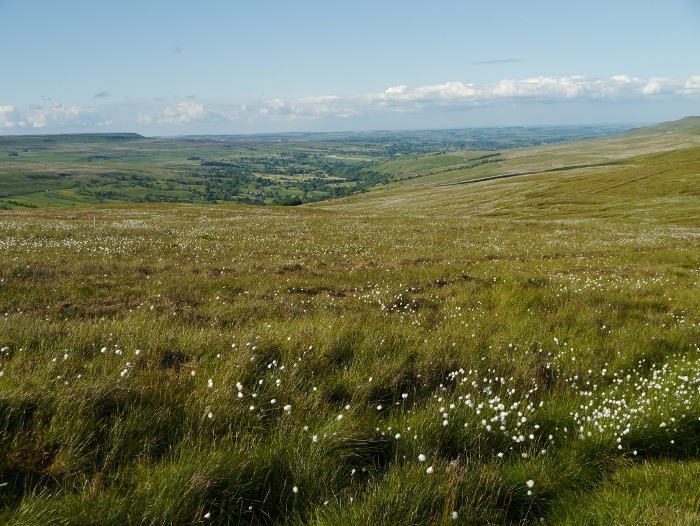 The top of Holmes Moss was covered in the most amazing display of cotton grass. Parts of it were absolutely plastered in the stuff, this gave us something to look at whilst we sloshed through very boggy ground. We were all gasping for water by the time Rawthey Gill was reached. We collapsed on its grassy banks to have lunch number two, my feet welcomed the chance for a bit of airing. Dixie decided to be a grumpy old lady and tried to take a chunk out of Reuben, he was quite clear in letting her know that sort behaviour is unacceptable. They pretty much ignored each other after that. The politics of being a dog eh? Thankfully Chrissie and I did not start brawling as well. The climb to the summit of Baugh Fell if I am honest was a bit of a grind. 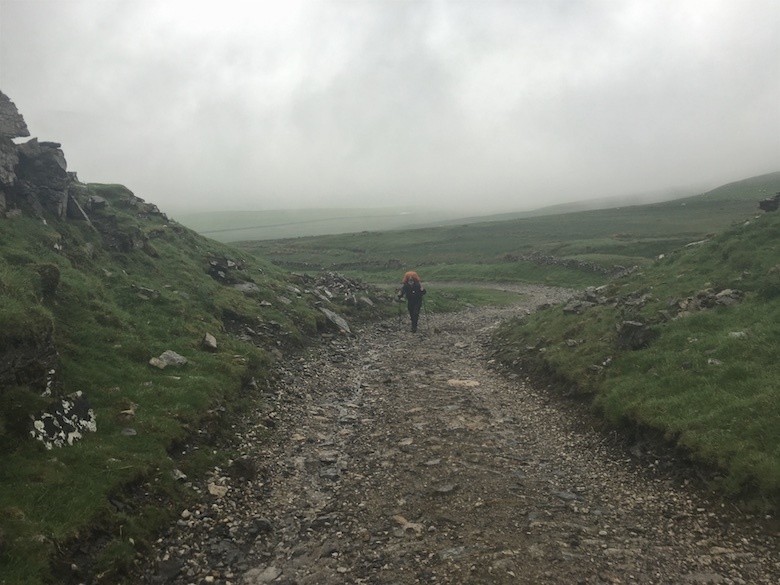 An endless plod up pathless slopes, frequent breaks to catch our breath only served to show how little progress we were making. The plan had been to camp right on the summit itself. 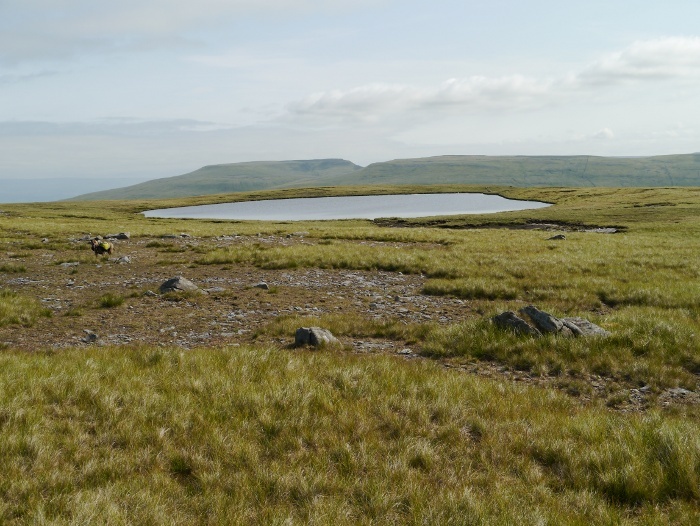 However there was a perfect grassy patch right next to one of the East Tarns. There was no hesitation in getting the tents up. Once again there was a strong breeze to cool us down. Settled into our respective tents I found myself falling into a deep sleep. The heat had taken it out of me and I was absolutely knackered. I had to force myself to get up and cook some food after an hour. It would have been all too easy to sleep right through until morning. Chrissie was feeling unwell and decided to have an early night. Dixie was already out for the count. I fancied doing the same myself but decided to make the best of being on the tops in such good weather. I had a stroll to the highest point with Reuben, getting a great view of the distant Lake District. There was layer after layer of hills stretching to the horizon under a silvery light. I stood for ages taking it all in before walking a boggy route back to the tents. 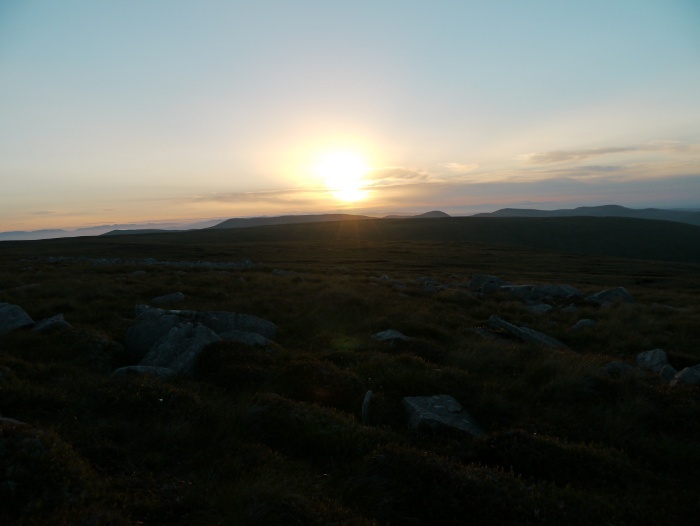 I brewed a mint tea and walked to a nearby rocky outcrop to watch the sun set. Reuben was sitting at my side when he suddenly sat bolt upright with his ears back. He rarely makes a noise but he started a low growl, his eyes fixated on something. The growl started to be punctuated with a quiet wuff, his back legs quivering. I could see absolutely nothing in the direction he was looking, not even a sheep. It was a bit unnerving to be honest so once the sun had set I returned to the sanctuary of a flimsy tent which is known to keep the ghosts at bay. By morning the wind had dropped and even at 7.00am it was hot. The lack of a breeze meant that midges made their first appearance of the trip, not huge quantities but enough to be a nuisance. At least they speed the packing process and we were on our way early, keen to get back to the car before it got too hot. 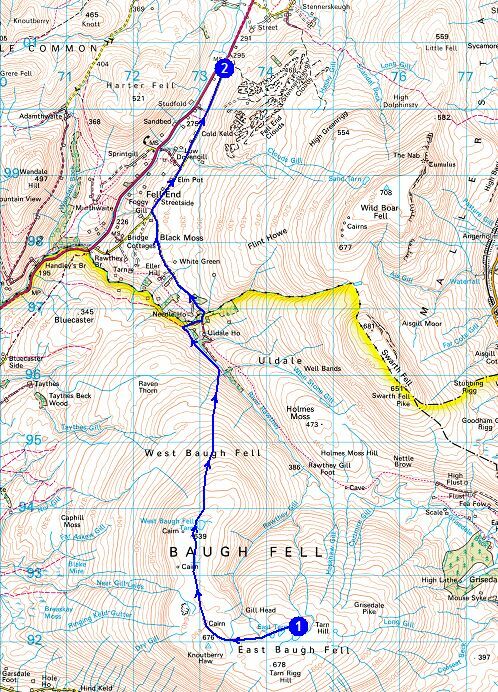 Looking at the map I assumed that Baugh Fell would give difficult walking across its expansive plateau. We stayed below the summit ridge, picking a route across grassy and stoney areas. The going was rather pleasant. This is a hill to come to if you want to get away from it all, we had a feeling that it is very little visited. There is a sense of space and wildness to it. 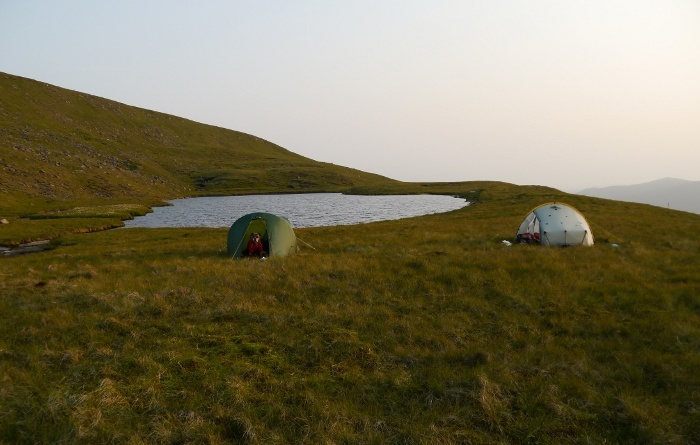 West Baugh Fell Tarn was our first destination, somewhere to filter water and rest in the building heat. 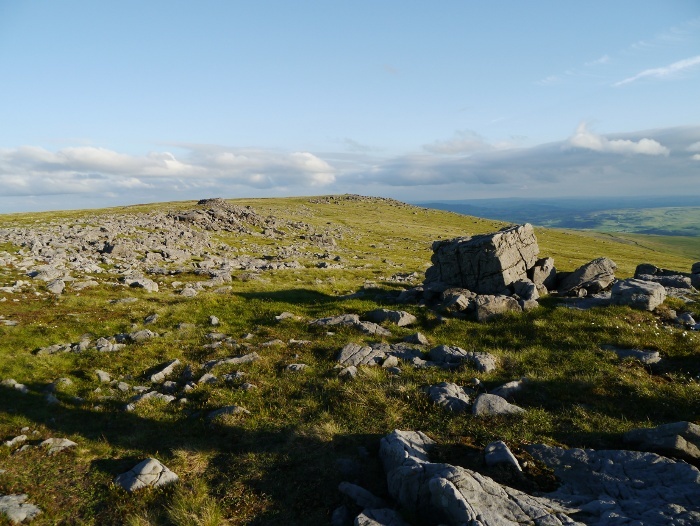 Another spot marked for a future wild camp (it is very exposed up there though!). 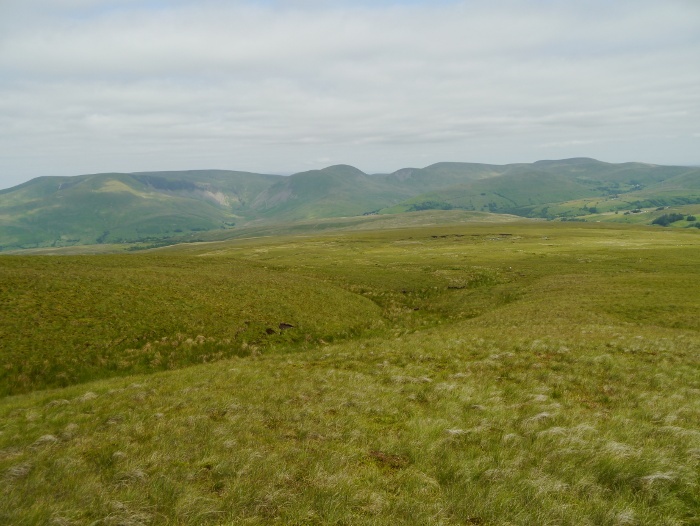 It was a long and slow plod down Baugh Fell’s endless slopes, the Howgills across the valley filling the horizon. It took a while to descend to the upper River Rawthey. With an elderly boxer in tow we decided to give the waterfalls a miss as steep ground is involved to reach them. Instead we took to the bridleway on the south side through the lush green valley. Sitting for lunch next to a deep pool in the river I was very tempted to go for a dip. However I am not sure of the etiquette of being naked in front of someone elses wife. I therefore saved Chrissie some embarrassment and kept my clothes on. The final walk along the lane back to the car felt like it lasted an eternity under the heat of the midday sun. The dogs tongues were almost touching the floor by the time we got back, Reuben needing to be dragged along. Aircon has never felt so good. Sometimes it’s possible to over plan and plan too far in advance. 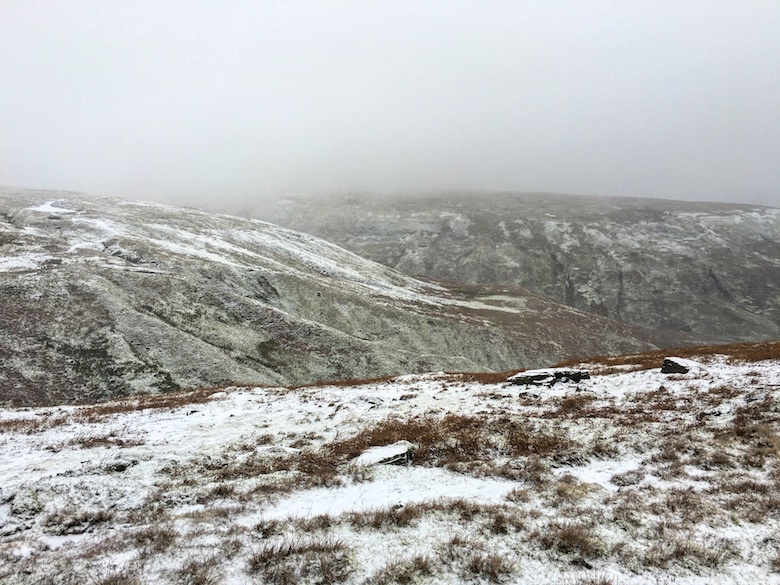 A long-standing commitment to spend a couple of nights in the Snowdonia Mountains with my good friend Rich was postponed because of the weather. Rain, low cloud and gales do not maketh a fun weekend. 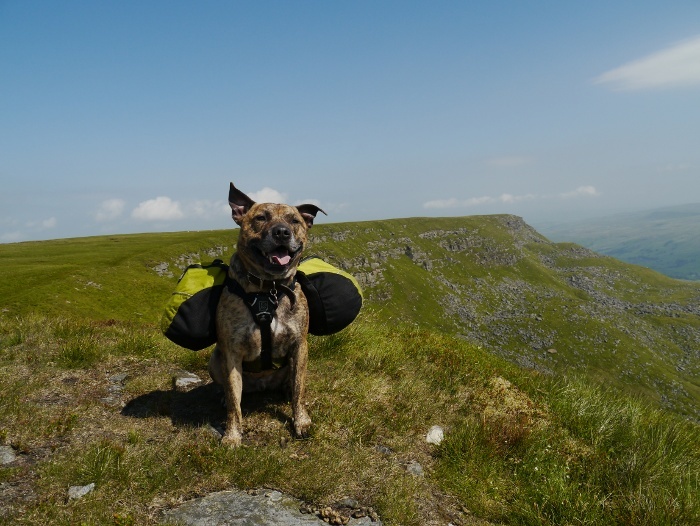 Rich had booked a day off work and we were still keen on tramping the hills, even if it would only be for one night. Therefore instead we found ourselves parked in the small Yorkshire village of Lofthouse on a Friday lunchtime. As we were getting ready a chap from a nearby house was watching us intently. He managed to grab and interrogate Rich who had set off in search of a bin. He was very keen on wanting to know why we had parked there, concerned that we were not using the car park. Rich explained that we were about to set off for a night in the hills and car parks often do not allow overnight parking. ‘Good job I had spoken to you then’, he said ‘as otherwise I would have reported your car as abandoned to the Police’. I’m sure that the local police have better things to concern themselves with to be honest. Rich was then quizzed on what he was going to have for dinner. With the local busy-body satisfied I felt safe in the knowledge that someone had their eye on the car. Looking at a map the night before I just came up with a vague idea of a route. 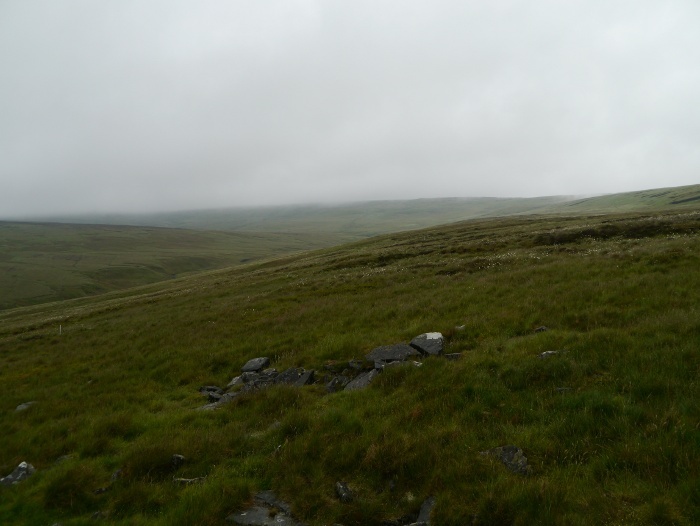 We would head in the general direction of Great Whernside, see how far we got and pitch our shelters. There were a couple of options for the return the following morning. With a complete lack of planning I felt strangely relaxed. 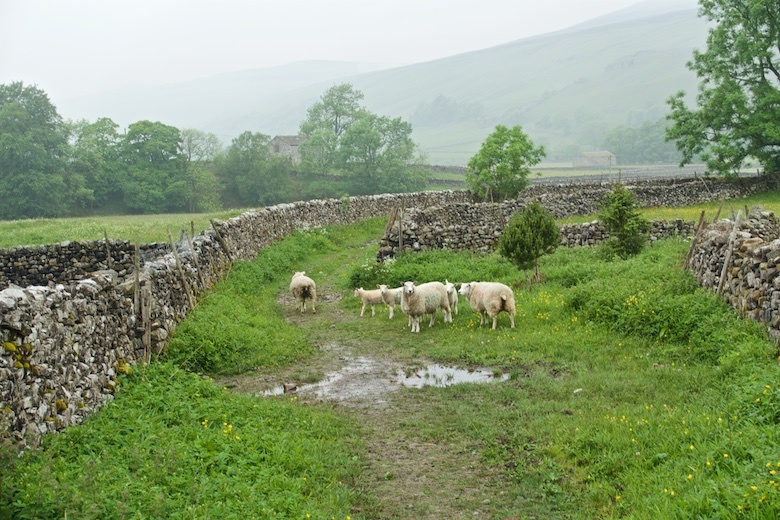 It was warm, humid and rather murky as we set off up the steep lane. It was forecast to brighten up later before a weather front arrived in the night to give a couple of days of heavy rain. We were keen to make the most of this dry day. Reuben is usually pulling at the lead at the start of a day in the hills, the excitement of new sights and smells getting the better of him. However for once I was pulling him up hill, the heat of the day meaning he was lagging behind. The track that contours high above the valley provided an airy promenade and easy walking. Unfortunately the views were lost in the hazy conditions. Once we were high and there was a cooling breeze Reuben was once again in his element. 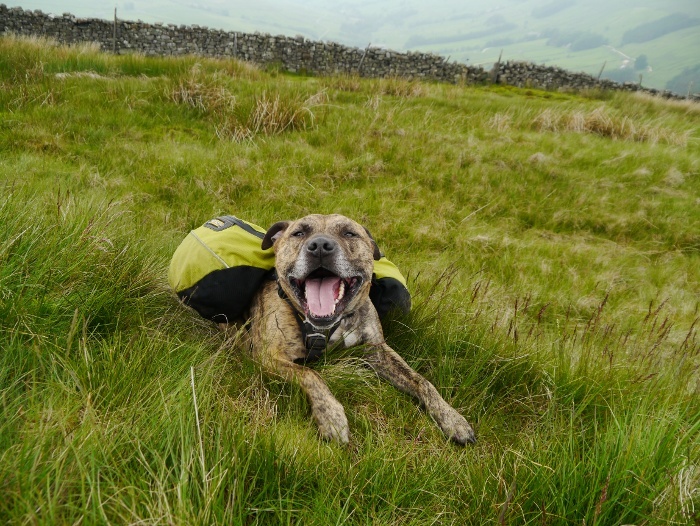 A happy dog on the moors. A shooting house gave shelter from the wind and somewhere to sit whilst we made coffee and ate lunch. The bright and airy side of the building with its large windows and panoramic views was locked. We had to make do with the dark and dingy unlocked section. 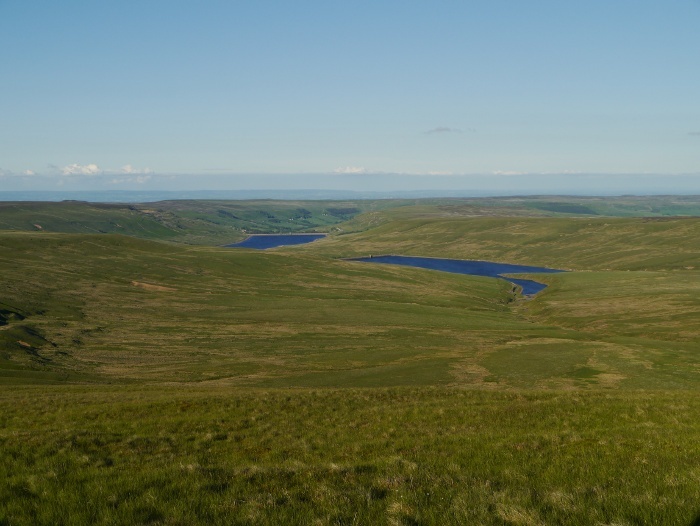 It did not take long to reach Scar House Reservoir, the high level track was flat once we were up high. As we approached the reservoir the clouds started to burn off and the sun came out. 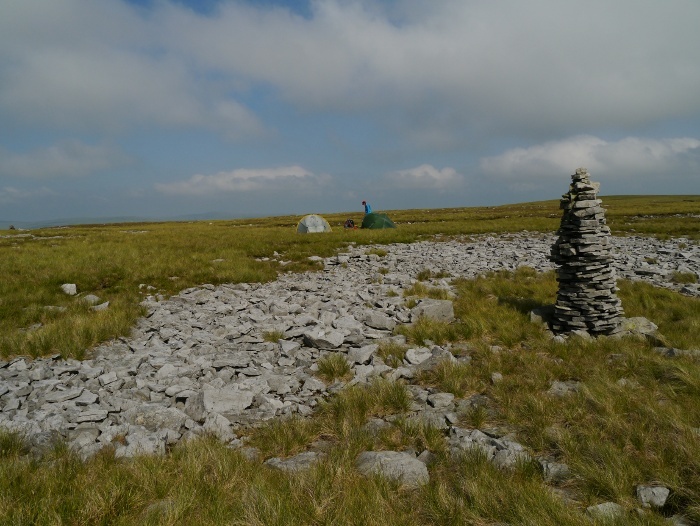 An initial idea had been to pitch at the head of Angram reservoir, however with our speedy progress and improving weather we decided to aim for the summit of Great Whernside. There were still hours of daylight left. Descending off the moors we took to the track on the northern side of the reservoir. It was an enjoyable walk up a valley I have never visited before. The scenery was idyllic and we were surprised at the lack of people out on such a fine summers afternoon. Sitting in a grassy meadow for food and water it was tempting to just pitch and relax in the sun. However we still had a way to go to the summit, yet alone find a place to pitch for the night. A track which was horribly eroded in places took us onto the moors again. 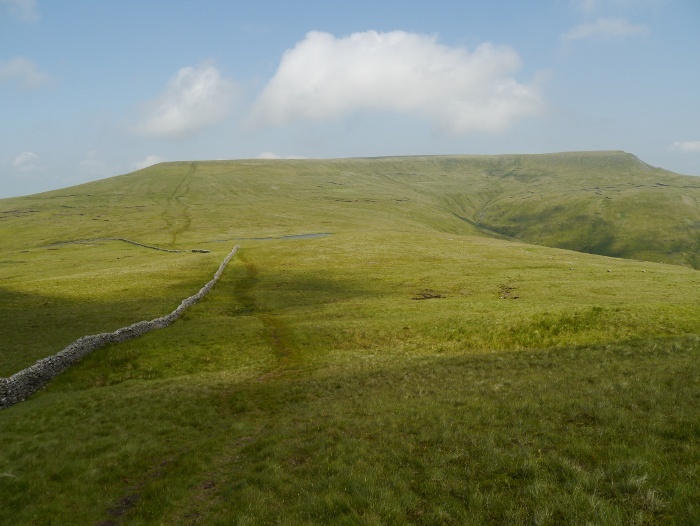 We left it at the watershed and picked up the right of way to Little Whernside, a faint path through the grass. 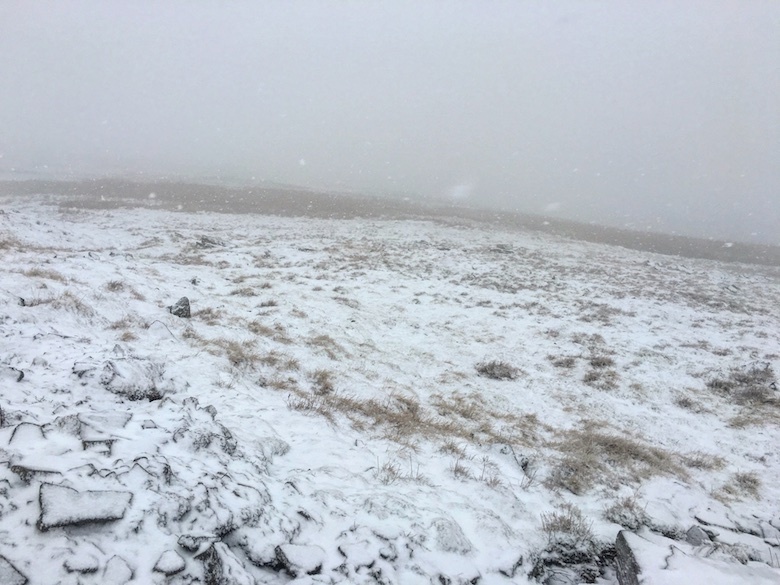 The conditions had well and truly changed since we had arrived at midday. The skies were almost cloudless and the visibility was superb. Even the distant North York Moors looked close and we could make out a distant city which we though was Middlesbrough. Best of all though was the immediate moorland. It was carpeted in the bobbing white heads of cotton grass. 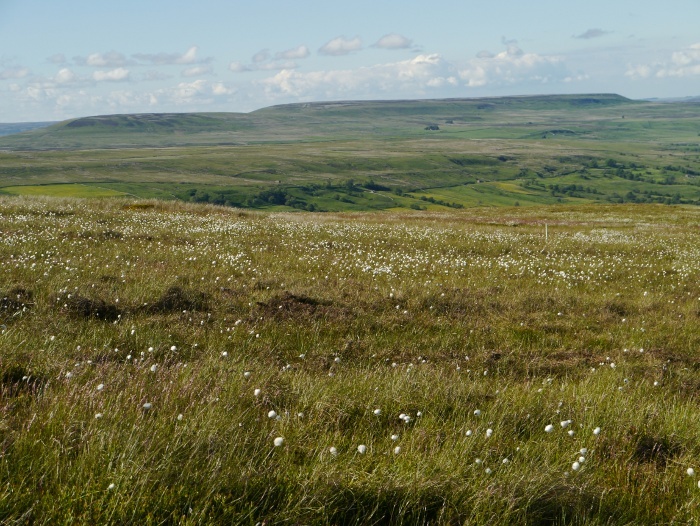 I have never seen it so abundant before, in places it looked like the moor was dusted in snow. We stood for a while under a blue sky and decided we had made a wise choice by coming up with a plan B rather than staying at home. 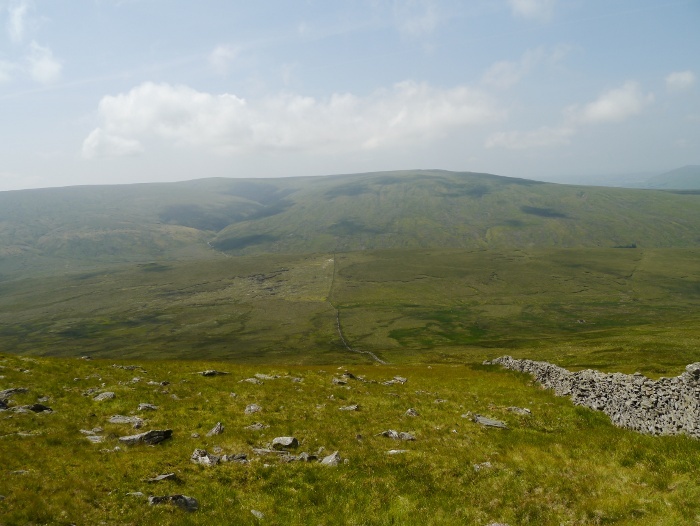 Steep grassy slopes led us to the summit of Little Whernside. 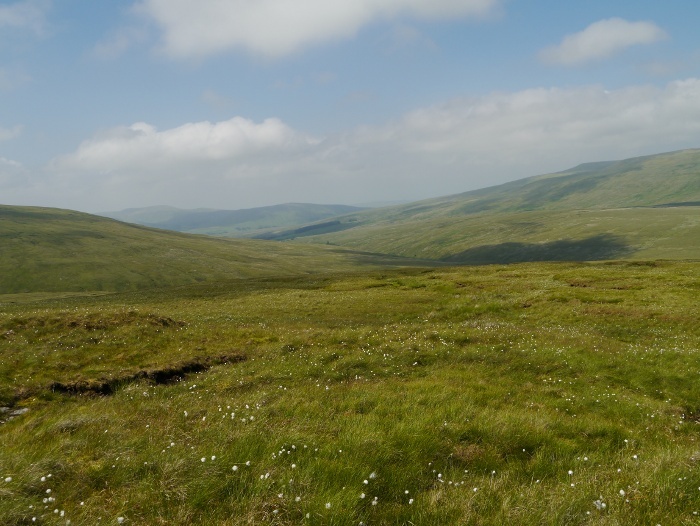 The small plateau gave difficult walking as it is covered in bog, deep vegetation and peat hags. 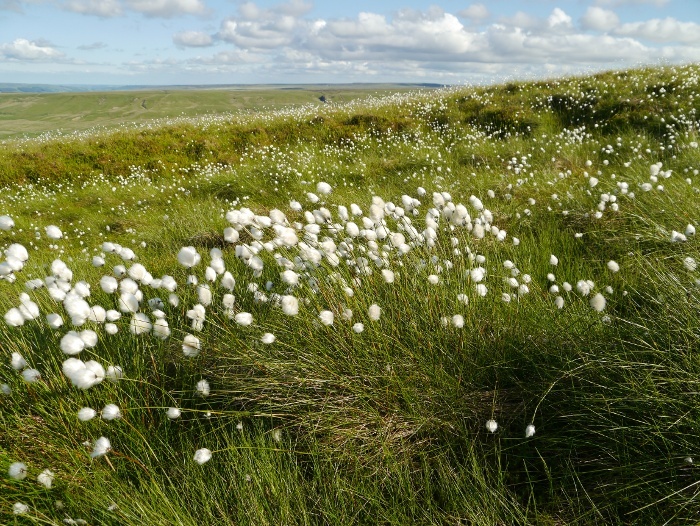 Continuing down its south western slopes the going underfoot became easy again with another display of cotton grass. 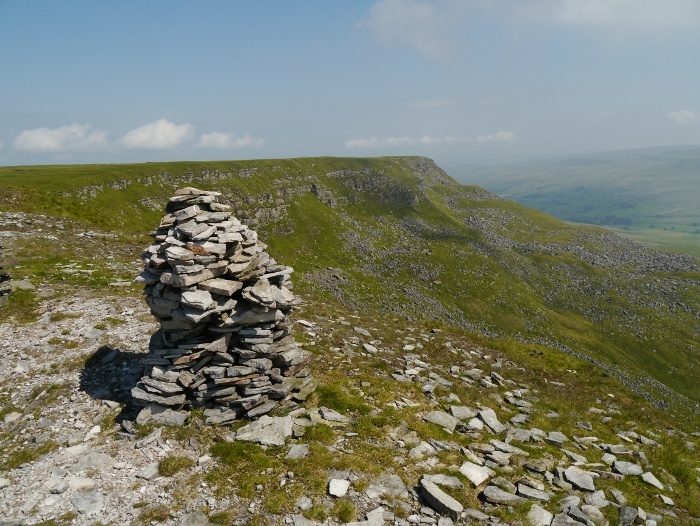 High on the Great Whernside plateau we came across the first person we had seen on the hills that day. Being local he had nipped up after work, a great way to spend the evening. 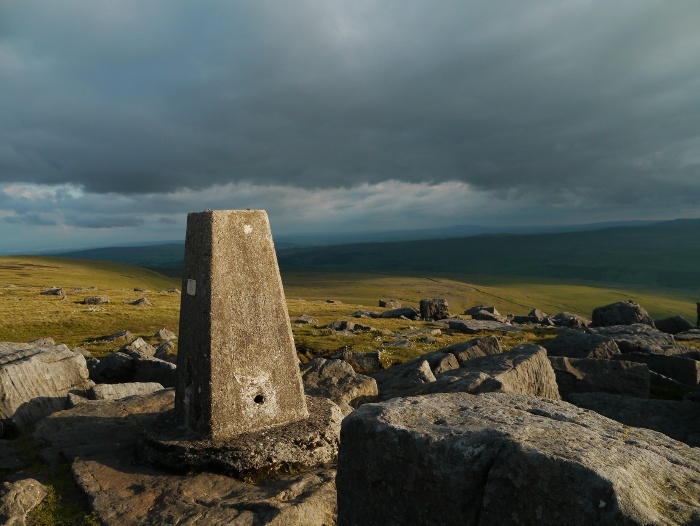 The summit area is vast and flat. In clear, warm and still conditions it is a place to linger and take in the expansive views. 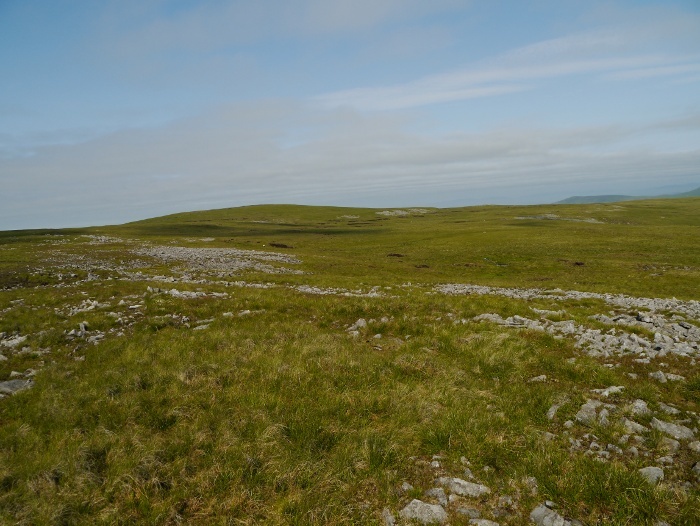 Moorland gives way to a rock strewn grassy plateau. We slowly wandered around taking photos and generally feeling pleased that we were high on the hills in unexpectedly good weather. Conditions can change though, and quick. Cloud starting piling in from the west, the sky soon covered in a bruised sheet. It was the edge of the weather front that was due to come in overnight. 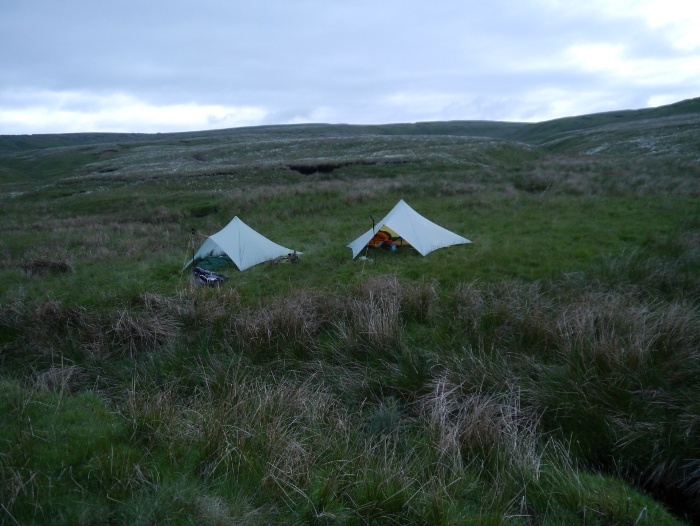 We felt it wise to move to lower, more sheltered ground to seek a pitch for the night. The skies cleared as quickly as they had clouded over. It was a fine late evening as we descended into the headwaters of Mossdale Beck. 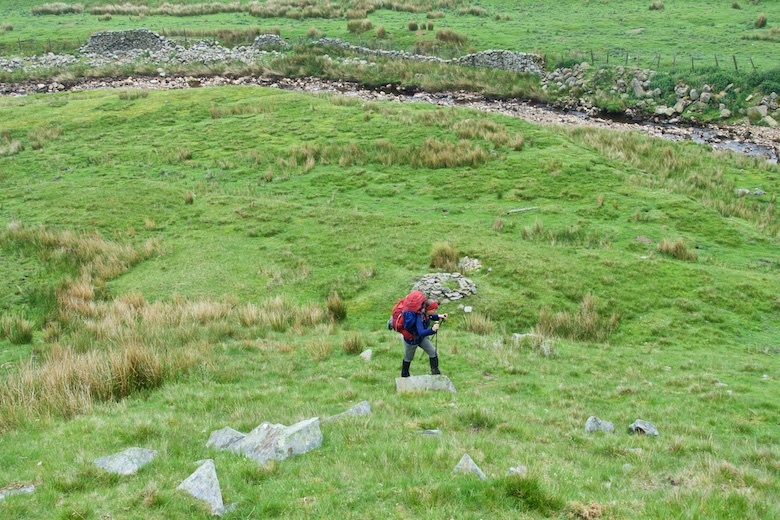 Steep rough ground did not initially look very promising but we soon found a grassy patch amongst the tussocks. The air was warm and still whilst we were pitching our Trailstars. This meant that a few midges came out to play. Not enough to make us thrash about in a music less dance but the annoyance factor was getting high before a nice breeze started to pick up. 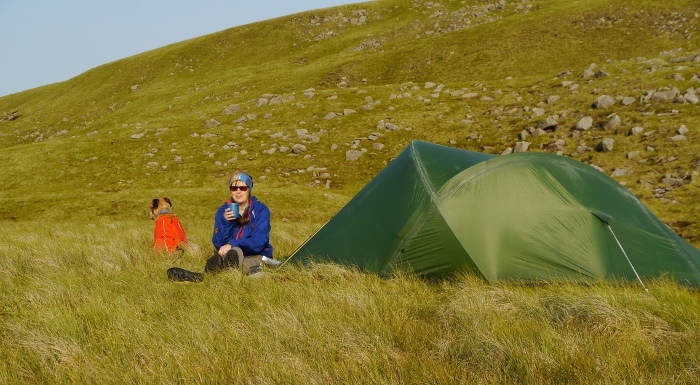 It was gone 10pm by the time we were pitched, making the most of the longest day of the year. After a 14 mile day carrying his own pack, Reuben was totally pooped. The minute we arrived he curled himself into a ball and started on an evening of snoring. I barely heard a peep out of him all night. It was about 11pm by the time I ate my dinner. It was not long before I joined Reuben in the land of nod. The rain arrived as planned in the night. I was aware that I briefly woke a couple of times with the sensation of moisture being blown onto my face. 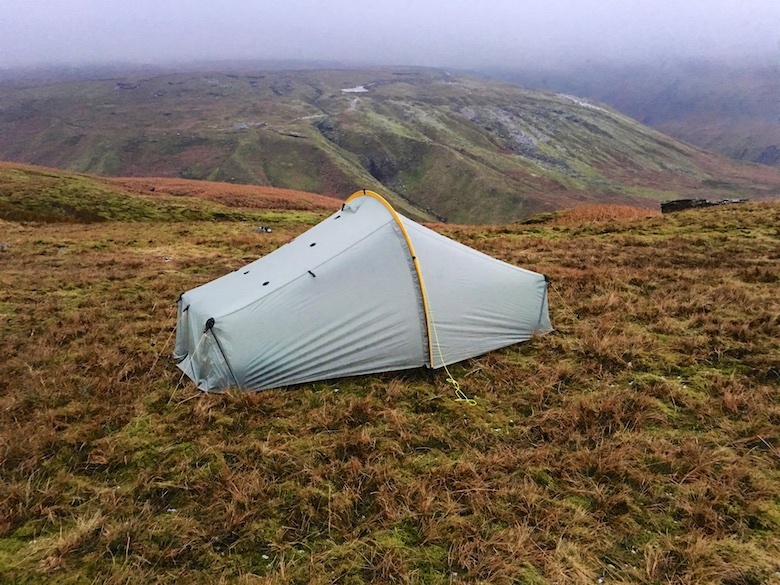 The wind had changed and the rain was being blown straight into the Trailstar. I can briefly remember thinking that I should be doing something about it but was soon asleep again. Rich said that the rain had been hammering down at one point. I woke up dry but Reuben who was nearer the door was a bit on the damp side. Thankfully he was wearing a fleecy waterproof doggie jacket so was nice and warm. 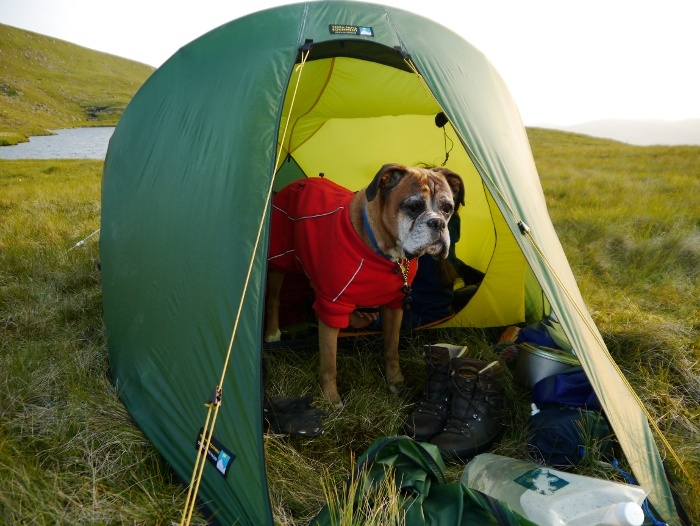 Later as I cooked my breakfast he did the important job of guarding my shelter. He had eaten a lot of wet food, he becomes fussy when backpacking so gets more meat than normal. This leads to unfortunate squeaks and a distinctive odour. I was pleased when he decided to pay Rich a visit. We managed to pack during a dry period, I almost considered risking not wearing waterproof trousers. I’m glad that I did because it started drizzling, then raining before finally tipping it down. 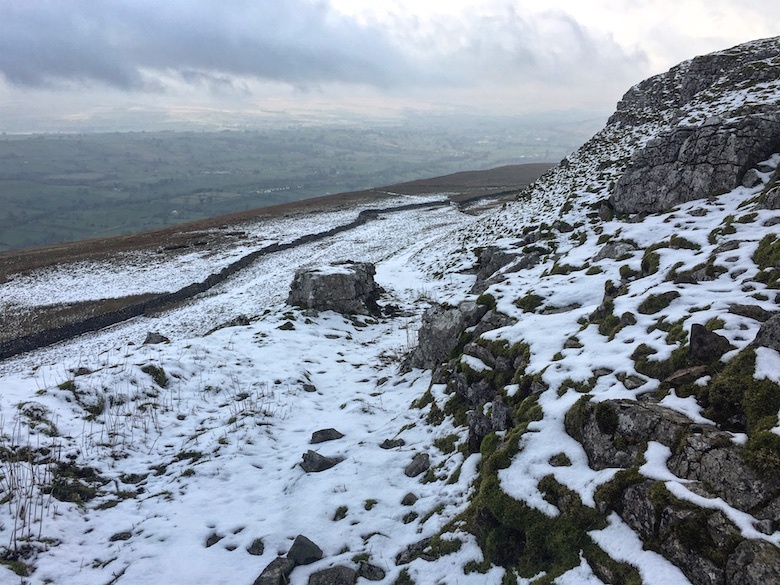 It was a wet old trudge down the trackless valley. During the heaviest rain Reuben would let out a little whimper and try to bury himself in the long grass. The looks directed my way suggested that it was all my fault. There were no endless views across the moors that morning. 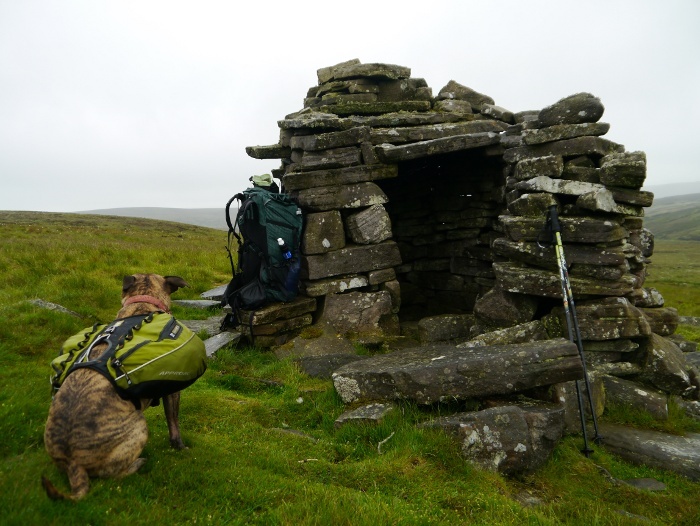 Just before crossing the watershed at Sandy Gate we came across this nifty little shelter. It only fits one person and Rich made some excuse about needing to sort out a camera or something. So he sat inside nice and snug whilst I enjoyed the rain with Reuben. Whilst there he decided that a snack was in order. Mates eh? From Sandy Gate a right of way led down the long and remote valley of Straight Stean Beck. 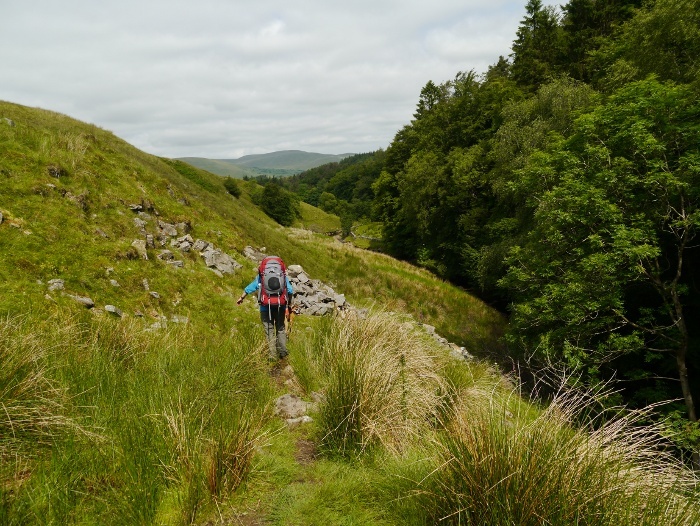 There is no sign of an actual path on the ground which made the going rather tough through the bogs and vegetation. With the constant rain we were on the damp side by the time we approached the first farm. A farmer out on his quad bike was mightily impressed by Reubens panniers. He thought that they would be a good way to knacker out his collie. 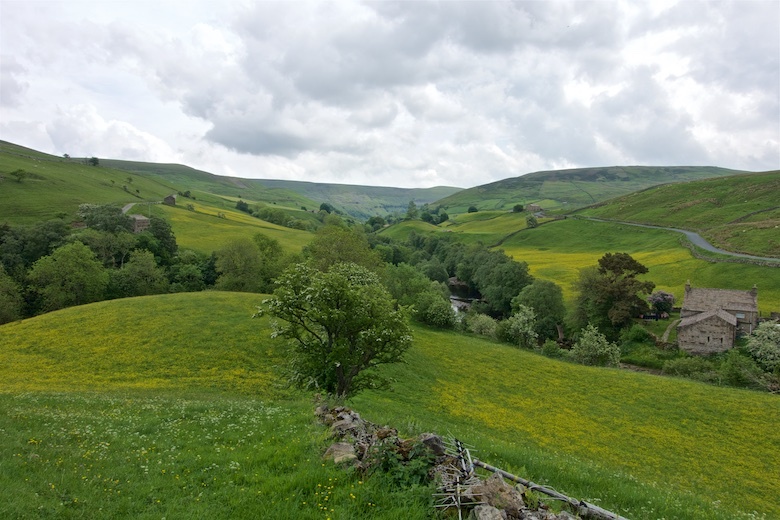 Further down the valley we entered colourful meadows, the river lined by lush green woodland. The sun finally decided to come out for a while and we had a pleasant loiter by a drystone wall to dry out. A very scenic stroll along the river and we were soon back at the car. Although made up on the hoof, the route turned out to be a fine one. Mid summers day was well spent. Fish and chips in Pateley Bridge were the reward for the physical effort. Reuben slept for a week when we got home, however I think this short clip demonstrates that he had a good time.